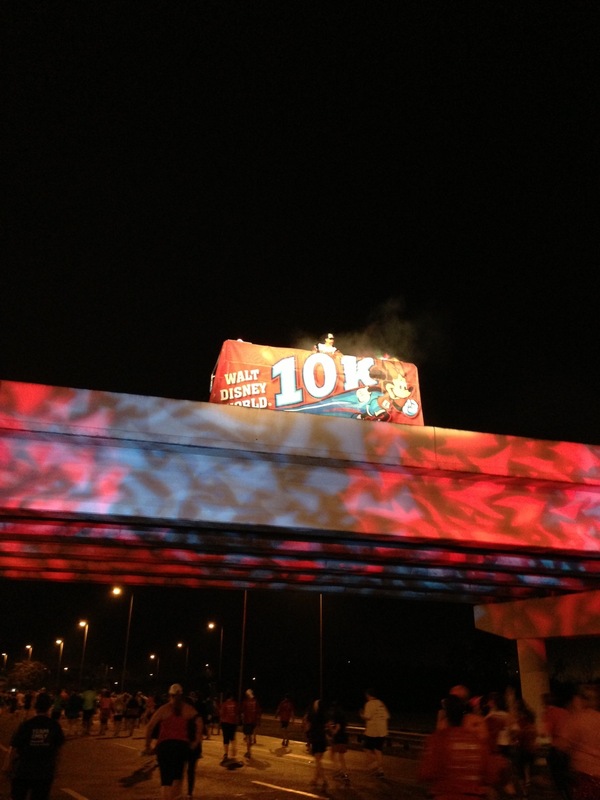 On Friday, January 10 I got to participate in the Inaugural Minnie 10k as part of Marathon Weekend at the Walt Disney World Resort. For daytime races, this always means a very early wake up call. 2:30 came very early, especially since my body was on Central time which means it felt like 1:30 to me. Buses started running at 3:30, which seems a bit insane for a 5:30 start. However, it really does take that much time to get 10,000 runners in place for an on-time start. The first 3 miles were a bit boring. I knew this part was outside of the parks but I thought there would be lots of character stops and other entertainment to distract us from 3 miles of boring, straight road. Unfortunately, there was only a DJ right after the start and one character stop that I saw before entering Epcot. This DJ was right after the start of the Minnie 10k. I did take time to stop at each and every mile marker to have my pic taken, which I’ve never done. 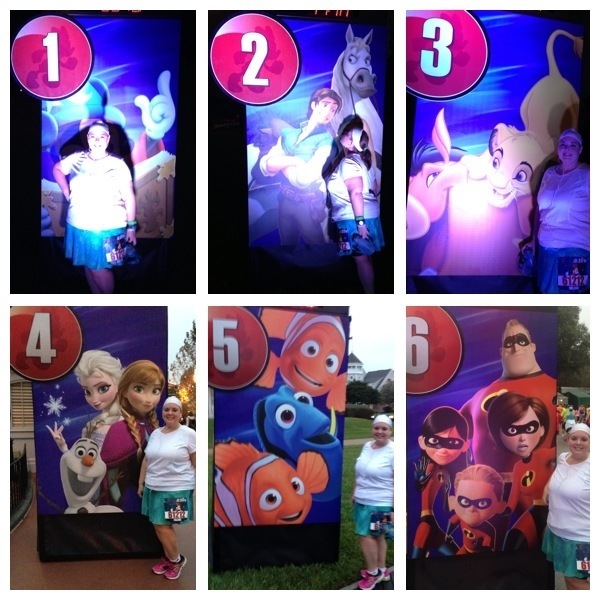 Lines were really long for the character stops but not too bad for the mile markers. After the first 3 miles, we headed into Epcot by way of a backstage entrance close to Test Track. There were several more character stops in Epcot, but lines were still longish. We ran about halfway around World Showcase before heading out to the Boardwalk area. A great part about this leg of the race is access to real restrooms. I took the opportunity to stop in Germany. Here, I ran into my friends Heather, Katie, Sarah, Jenn, and Penny, who were all running together. They passed me shortly after I saw them. We ran past Boardwalk, circled around by the Swan and Dolphin resorts, past Yacht and Beach Club resorts, then back to the International Gateway. I ran into my friends again, who were in line for Tweedle Dee and Tweedle Dum. They motioned for me to join them in line so I did. We only took one pic with all of us, so it’s not like my joining them held the line up. I stuck with them for most of the rest of Epcot. We spotted Chip and Dale, and since we were close to the end, we took time to jump in that line, too. I love how this pic turned out. I again kept up with them until we got to the 6 mile marker. I wanted my pic with it so I got in that line and they kept going. I had plenty of energy to sprint to the finish and just like that, the Inaugural Minnie 10k was over! My thoughts about this race are mixed. I loved the race shirt, bib and medal! Love the shirt, bib and medal! I also really loved that lots of people were dressed in costumes, and most everyone I saw was running for fun. It makes for a very fun race when everyone around you is enjoying it. I really thought they should have stepped up the entertainment for the boring first 3 miles. There were also too few water stops, only 3 for the entire race. It was a very warm and humid morning, and 3 stops for more than 6 miles is not enough. There were also all water stops only, no electrolytes. This needs to be corrected. 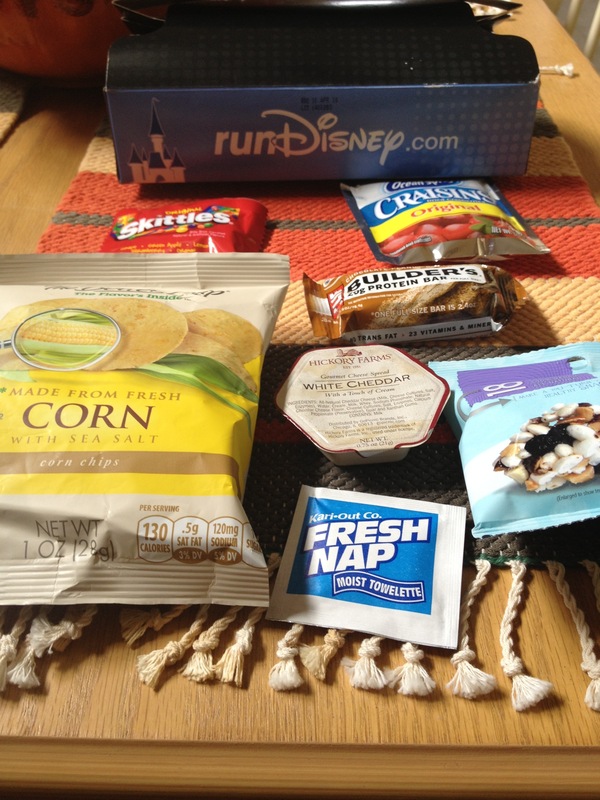 I did like the post-race food box. These tend to still get mixed reviews but I think they are great. They seem to be stepping it up on the contents, too. Hello, Skittles! Would I do it again? I don’t know. Maybe. I like the distance for what it was to me, a way to participate without having a race be the center of my vacation. The purpose of my trip was to volunteer (more on that later). It was nice not to have pre-race jitters, not have to deal with the usual taper stress and not have to watch what I ate and drank the days before. I was also ready to head straight to the parks after a quick shower, so it was nice to have that extra energy. I still like the half distance for when the race is the main part of my vacation, though. Minnie seemed impressed to finally have her own race, too. 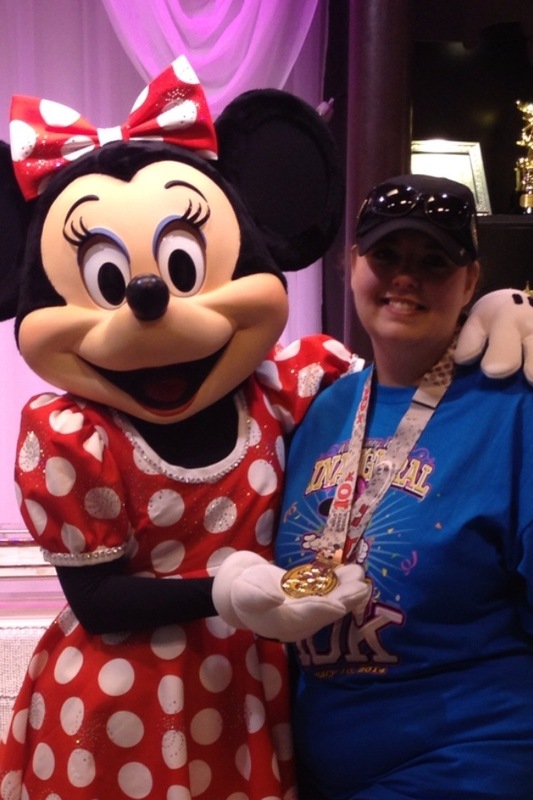 Minnie loved that she was featured on the 10k medal! Memphis does not do winter weather well. Any threat of winter weather usually turns into a non-event, but even the hint of some sort of frozen precipitation sends the entire city into a tailspin. 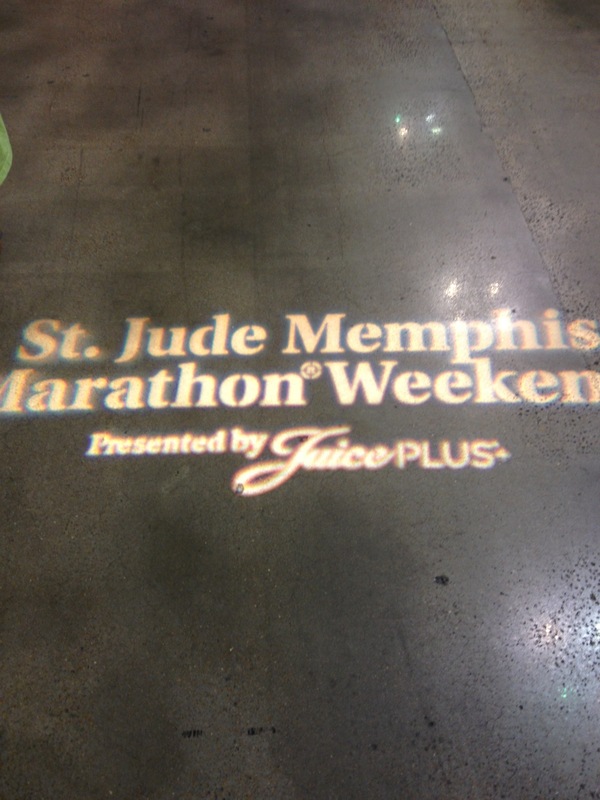 That happened this weekend, and the St. Jude Memphis Marathon Weekend was cancelled. When December 7 first appeared on the 10 day forecast, it was supposed to be in the 40s at race time, warming up to the 50s throughout the day, perfect! Every day after that, it looked worse and worse. 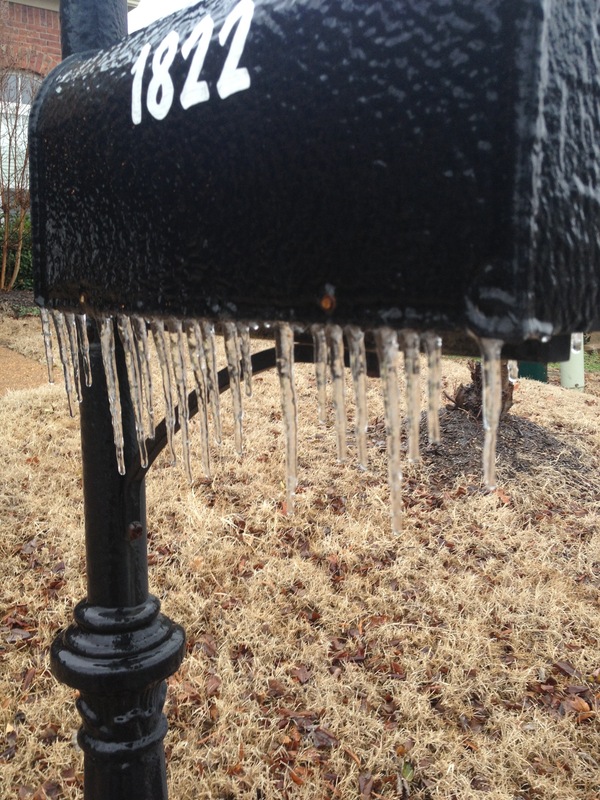 Even though it was in the 70s here on Wednesday, it was predicted to be a historical ice storm. By Thursday, schools and events were being cancelled all over the city, yet it was still in the 50s. The SJMMW event directors kept saying the race would go on as planned unless the course was deemed to be unsafe. Friday came, the day of the epic ice storm. Yes, it rained pretty much all day long. Yes temps hovered around freezing. Yes, ice accumulated in trees and bushes. However, the roads remained clear. Ice accumulations thwarted race plans. 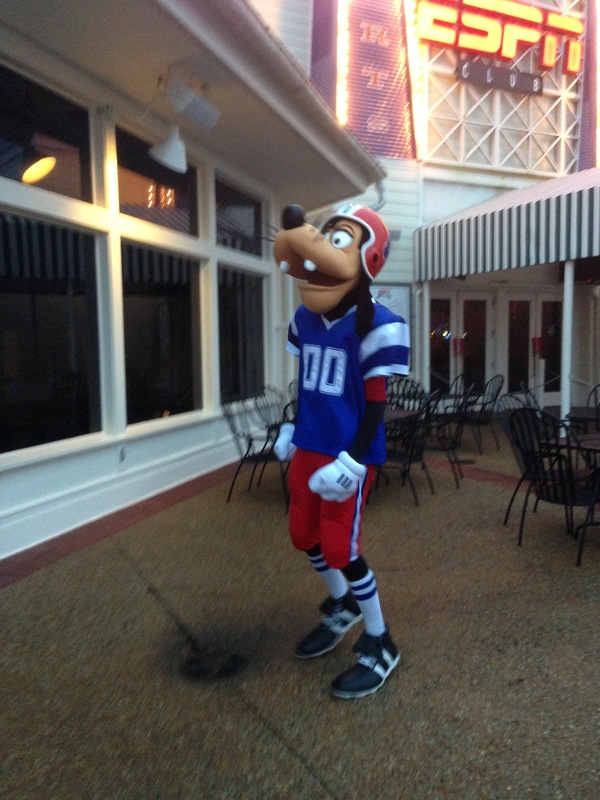 I was in good spirits as I headed to the Heroes Pasta Party. I was sad my parents had decided against making the trip for the weekend, but I was meeting friends there so all appeared well. I had been so concerned that I would not make it downtown from the suburbs on race day that I had not even allowed myself to get excited for the weekend. Arriving at the pasta party, realizing the roads were in good shape and I was going to make it after all, I finally got excited. My friends and I made another trip through the expo, and I let myself look at the medal for the first time. We went into the ball room, took our seats and got our food. I then received a text from another friend that she was sorry the race had been cancelled. Cancelled?! No! We are here! At the event! It’s not cancelled! Then a text from another friend. Cancelled! Then a news bulletin came across my phone. Cancelled! Still no official word from the race directors and we were at the event! How could they not tell us? About 20 more minutes passed, and by then the whole room knew. The ALSAC CEO took the stage and gave us the official news. It was then that I got the text notification from St. Jude. Reality started to set in. My 2013 St. Jude Half Marathon was not going to happen. The expo had been great! I went on Thursday after work. It wasn’t very crowded so packet pick up was a breeze! There were lots of vendors, and more freebies than I’ve ever gotten at an expo. There was an area to write a message on a wall to the kids of St. Jude. 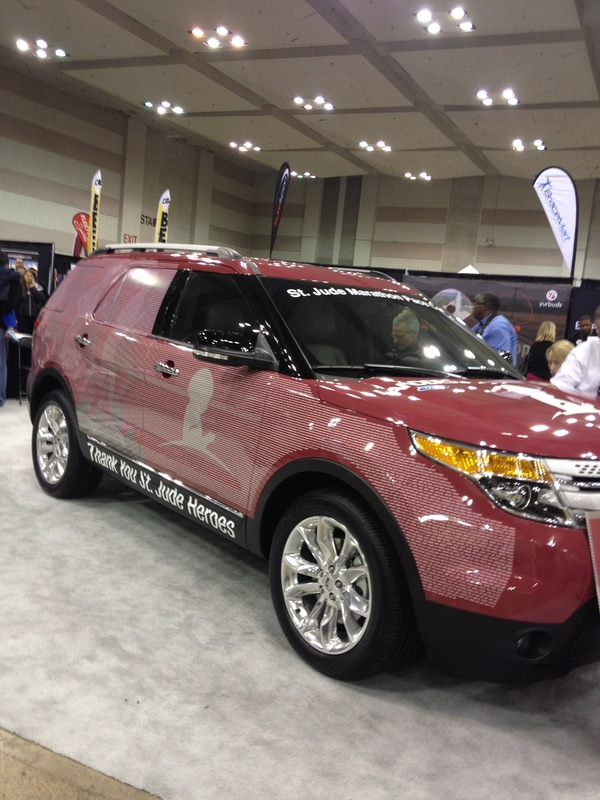 The coolest thing was the official pace car provided by Landers Ford. The names of all the Heroes were on the official St. Jude Pace Car. There was an overlay on it with all of the names of the Heroes. My name was on the official St. Jude Pace Car. They also had a photographer to take your picture by your name with your bib. We stayed about an hour then headed to dinner at Spaghetti Warehouse. Other than disappointing news, the Pasta Party was fabulous! 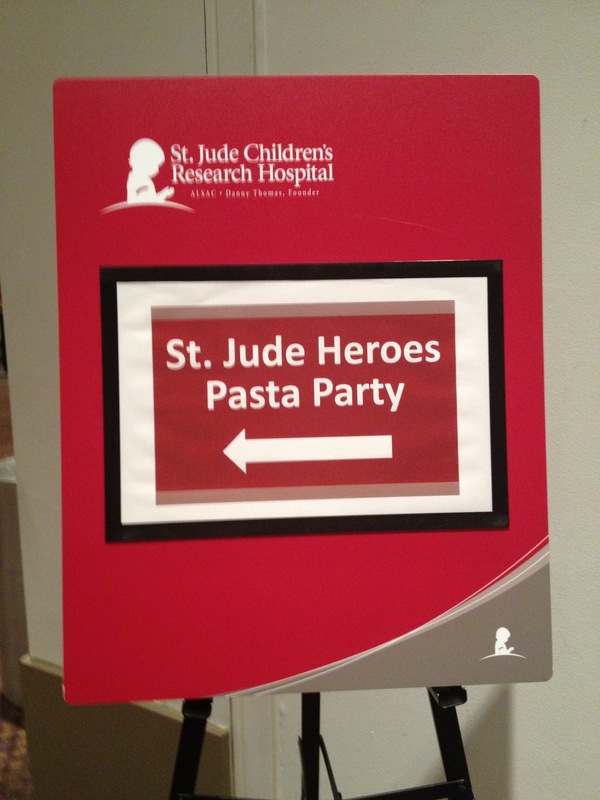 The St. Jude Heroes Pasta Party was truly a festive occasion. It was the largest plated dinner in the history of Memphis, we were told. They were very prepared, too, with 11 buffet lines, and about a dozen drink coolers along the walls with soda, bottled water, and tea. There were only 2 beer lines but they moved quickly. After Rick Shadyac gave us the bad news, they continued on with the featured speaker. Hillary Husband, a 6 year patient of St. Jude, told us her story. She was diagnosed when she was 14 and is still being treated. 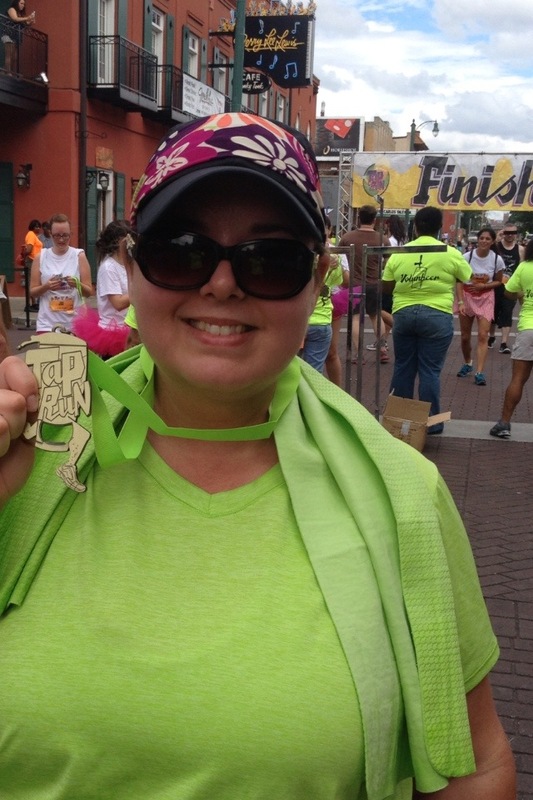 She recently walked an entire marathon in the halls of St. Jude because she did not want her disease to get in the way of her goals. The staff even set up a finish line for her to cross. Even more impressive is that her route was around the radiation unit. She figured out that 11 times around was a mile. Can you imagine the mind-numbing boredom that would come with that many laps? And to do that more than 26 times? She is an amazing young lady, to say the least. I almost lost it when she said we are the ones who inspire her. I left the party thinking that was the end of my SJMMW 2013 but I was wrong. Later that night, one of my friends texted me and told me his friend, who was here from Texas and who was planning to run her first marathon here, wanted to take a St. Jude Hospital tour since she couldn’t do the marathon. He asked if I could help make that happen. I told him I would try. So, I contacted one of my friends who works there, and he was able to do the tour. So, Saturday afternoon, 4 of us headed to the hospital for the tour. 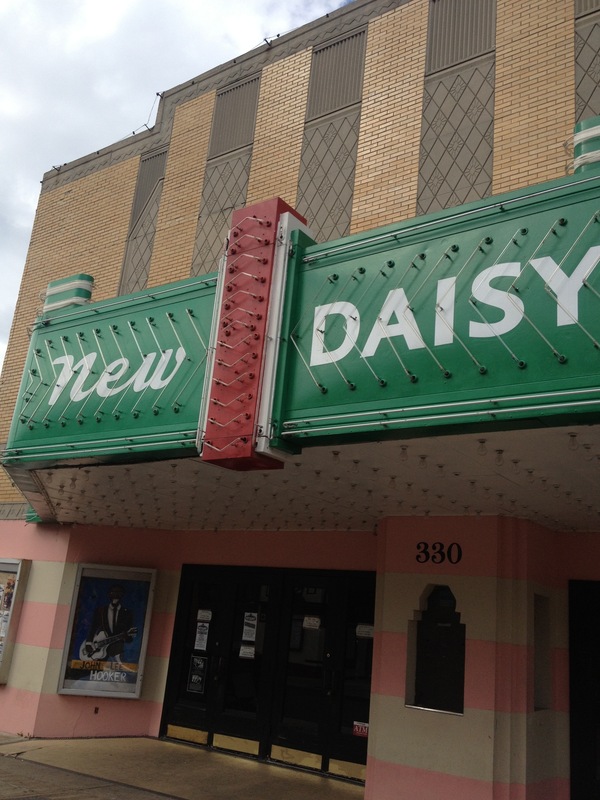 Three of us had taken the tour back in the fall (read about that here), but we still learned even more. It truly is an amazing place! 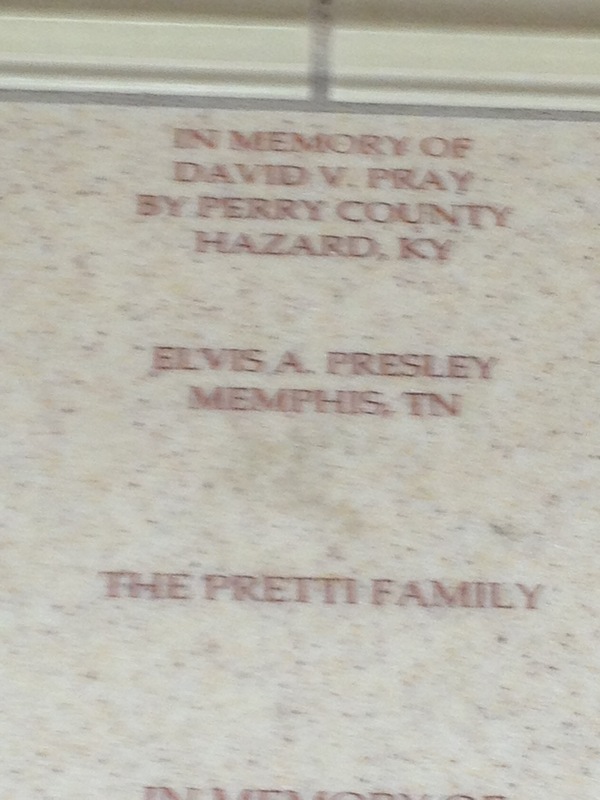 Elvis Presley was a St. Jude donor. 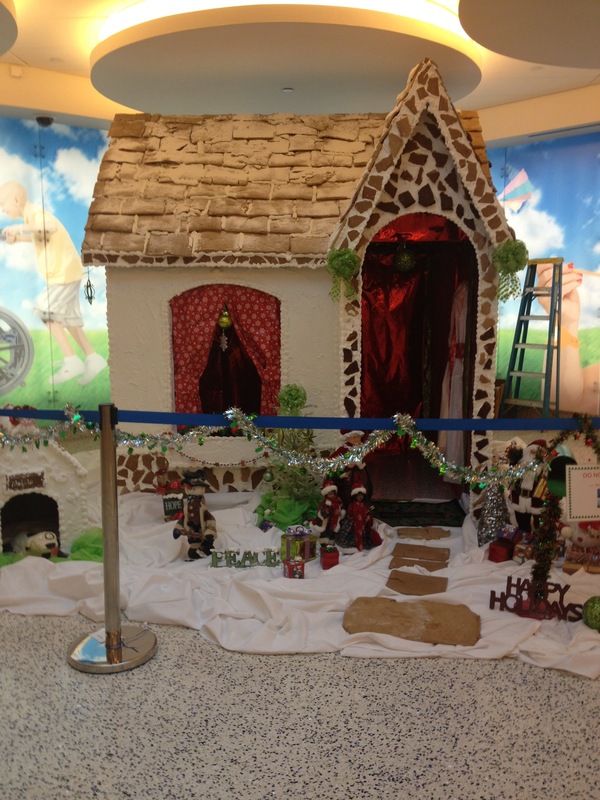 This gingerbread house at St. Jude is about the size of a small bathroom. I also learned that many people decided to run the route anyway, and the race personnel greeted finishers with their medals. What a neat thing for them to do! I wish I had thought of it. I will run my tribute miles at some point in the future. I’m just not sure when yet. As a consolation, we are able to transfer our registration to Rock and Roll Phoenix, Rock and Roll New Orleans, or Rock and Roll Nashville. Other options are a full refund or donating your entry fee to St. Jude. At the moment, I’m leaning toward Nashville. If I don’t do that, I will definitely let them keep the fee. So, you may be wondering why it was cancelled if the streets were clear. Again, Memphis does not handle these things well. The finish line was a solid sheet of ice, sidewalks were unsafe, and there were trees down along part of the course, due to the weight of the ice. 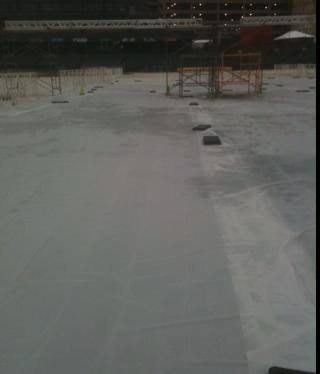 The finish line was a solid sheet of ice. 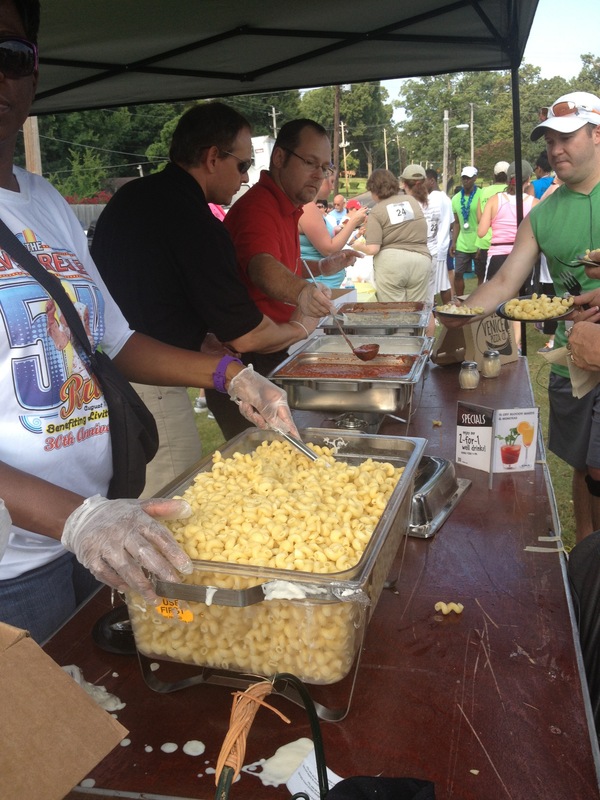 This photo was taken by a volunteer and posted on the Memphis Runners Track Club Facebook page. Several thousand people in Memphis were without power, and since temps were going to be below freezing for a few days, they were concerned more trees and power lines would fall, causing more people to be without power. 30% of the volunteers had already backed out, as had 15% of the medical staff. 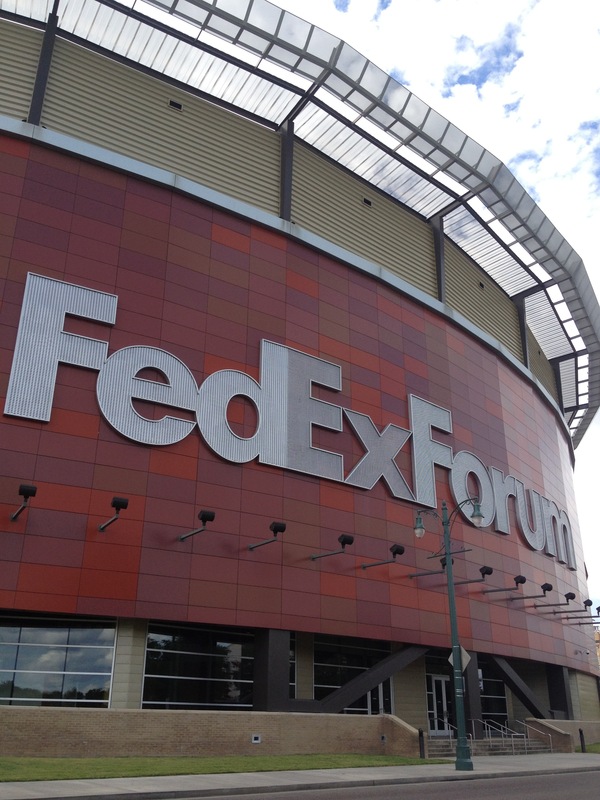 Additionally, the City of Memphis told race officials resources such as police, fire, and medical support could not be dedicated to the race while the city was under a state of emergency and might be needed elsewhere. It’s disappointing because it really did turn into a non-event, like it almost always does. At the same time, there was so much uncertainty about conditions in the hours leading up to the start that a decision had to be made. They made the best decision they could. 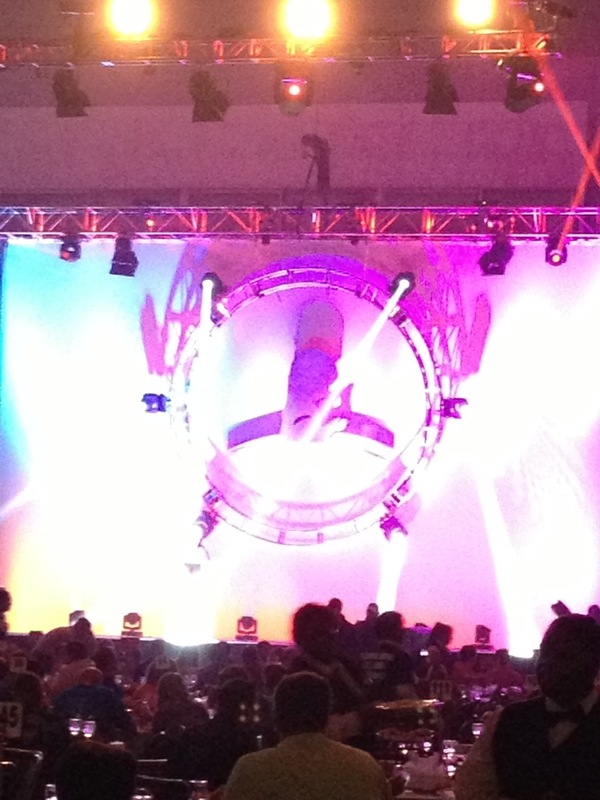 Race or no race, St. Jude Heroes raised $8.2 million for the kids of St. Jude. The average donation is $33. 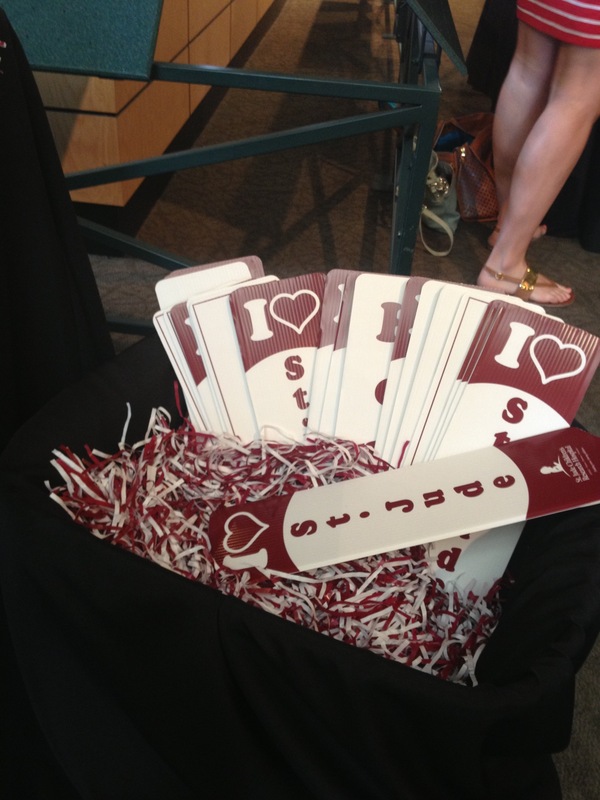 That’s a lot of people wanting to help support St. Jude’s lifelong mission of finding cures and saving lives. God willing, I will participate as a hero again in 2014. Like my Facebook page http://facebook.com/myglasssneaker. Squeeeeeee!!!! I’m so excited! Yesterday was a great day because I got into my very first runDisney meet-up, which is pretty much like hitting the runDisney lottery. This is something I’ve wanted about as long as I’ve wanted to do a runDisney race, which is as long as I’ve been running. 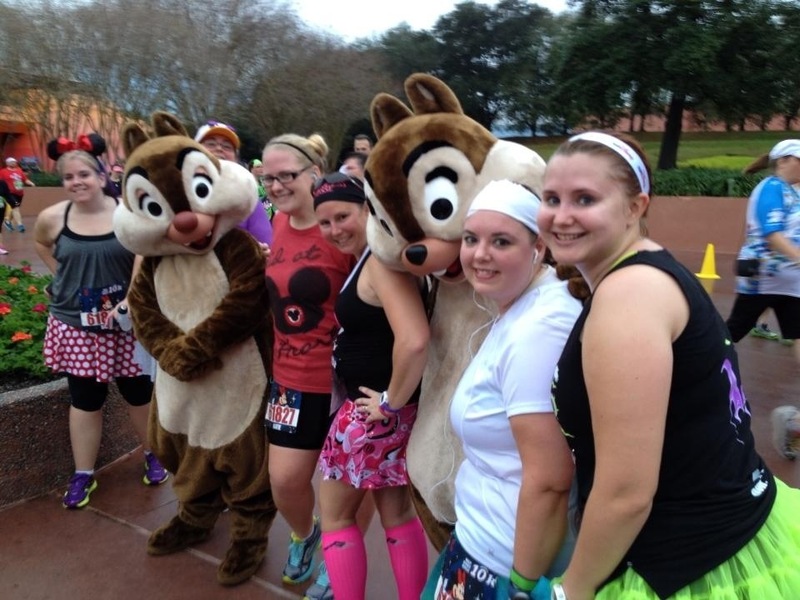 Traditionally, these meet-ups have taken place early in the morning before the expo opens on marathon and half marathon weekends at Disney Parks. A week or two before the event, a post will appear on the Disney Parks Blog that will instruct those interested to send an email to a designated email address. 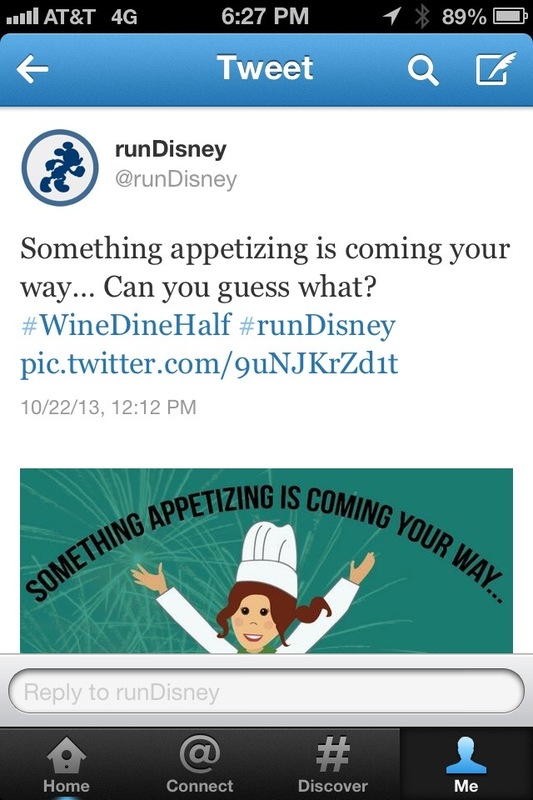 Once the blog post goes up, runDisney will send out a tweet telling people to go visit the blog. Usually the tweet happens about a minute after the blog post goes up, although not always. Disney doesn’t say exactly when this will happen, but they usually send out a series of “teaser” tweets alerting everyone that the time is close. So, people will literally stalk the blog for days for their chance. They fill up so fast that usually if you don’t send the email within 2-3 minutes of the blog post going up, you are out of luck. Even then, it comes down to whose emails got there the fastest. I honestly never thought I’d actually get in, so I’m thrilled! Here’s how it went down. I’m off work this week with no plans and nowhere to go, which almost never happens. I originally had the week before last off and was going to do fall cleaning on my house. I had a hunch that the meet-up post for the upcoming Wine and Dine Half Marathon Weekend would happen this week, so I figured I could fall clean this week as good as I could two weeks ago and moved my vacation to this week. That would put me in a better position to at least be watchful. I had my Twitter alerts set so that I would get a notification for all runDisney tweets, and I already had an email drafted from my gmail account (I’ve read that gmail sends faster than yahoo). I really wasn’t expecting the post until later in the week, but I was as prepared as I could be. Yesterday morning, I had to go to my weekly Rotary Club meeting. I am the President, and our District Governor was coming for his official annual visit. So, I couldn’t skip that. About 20 minutes into the meeting, the first (and what ended up being the only) “teaser” tweet came. I thought to myself, “Please don’t do this now! This is literally the only obligation I have all week!” So, I went ahead and pulled up my email draft so it would be ready for “go time”. After the meeting was over, I had to have my official photo taken with our District Governor, and of course, his wife had to take about a bazillion photos (it was probably only 2). I shook his hand, thanked him for coming, said a few pleasantries to his wife, and then, out of the corner of my eye, I saw my phone on the table light up. I practically leaped over to it and saw that it was the Twitter notification for THE tweet! I didn’t even read it. I went straight to my email, hit send, watch the circle go round and round for what felt like 5 minutes (more like 20 seconds) and THEN went back to read the tweet. I then read the blog post to make sure they hadn’t changed anything about the method to register for it (they hadn’t). It was also then that I saw it was going to be the very first nighttime meet-up and would feature a viewing area for attendees to watch Illuminations, Epcot’s nightly fireworks and laser show. Attendees would then get to sample food and wine featured as part of Epcot’s International Food and Wine Festival and hear Olympic athletes share training and nighttime running tips. The evening would be capped by a run through an empty Epcot and many other surprises. This was one meet-up I wanted to get in very badly! 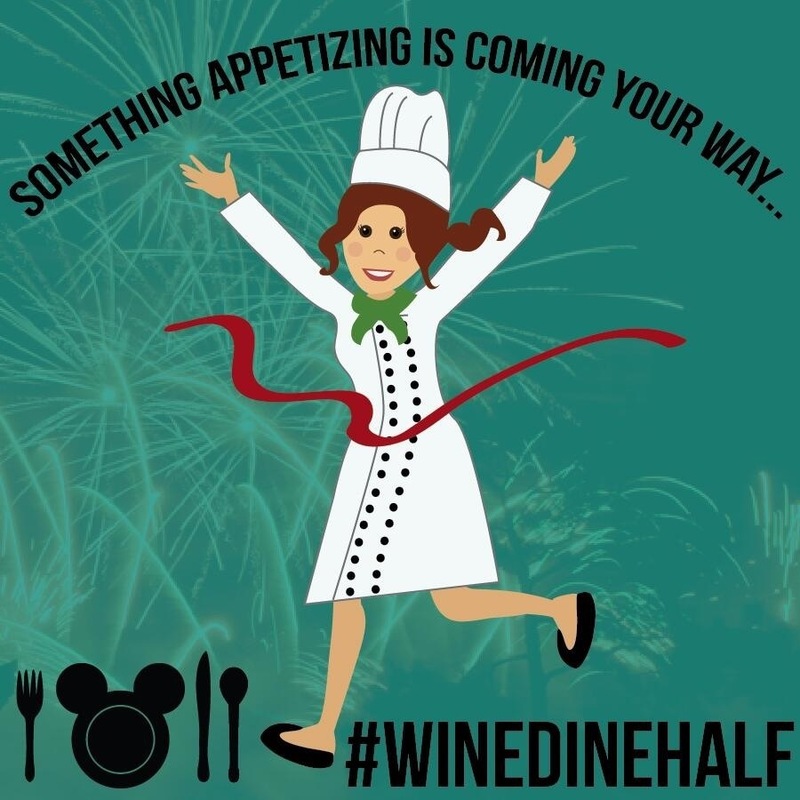 Not only is the Wine and Dine Half Marathon my inspiration race and the reason I started running 2 years ago, the Epcot International Food and Wine Festival is my favorite event at Disney. So, for the next 3+ hours, I anxiously waited for them to post the list of attendees! 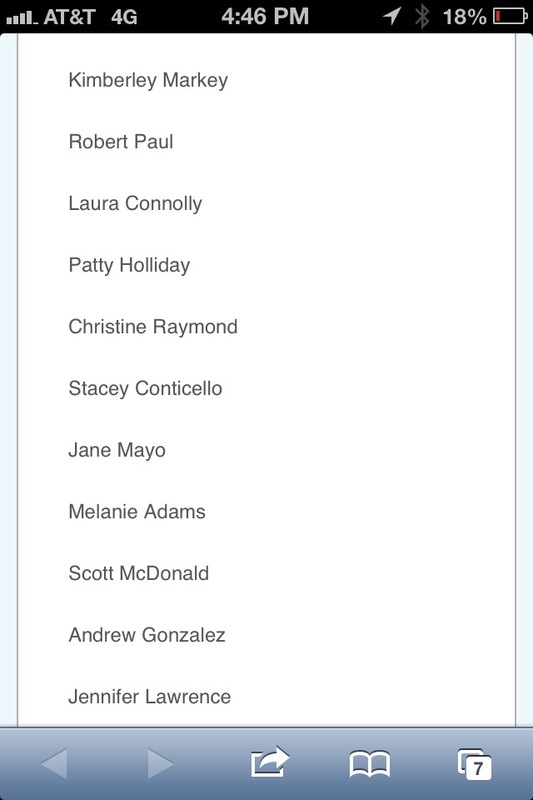 I hoped with every ounce of hope I had that my name would be on the list. I knew I sent the email as fast as I possibly could, but did it get there fast enough? 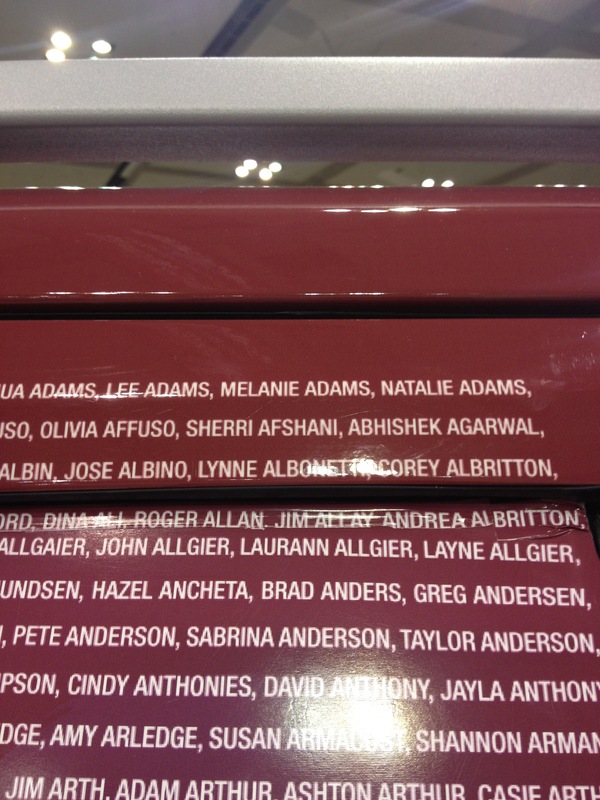 Finally, the list was up, and I found my name there! So, in a couple of weeks when I head down to the Wine and Dine Half Marathon Weekend, my trip will begin with this awesome event, and I cannot be more excited! This cute pic was in the teaser tweet. I’ll be tweeting live and posting on Instagram during the event so make sure you follow me if you want to join the fun. Look for a blog post later about it, too! 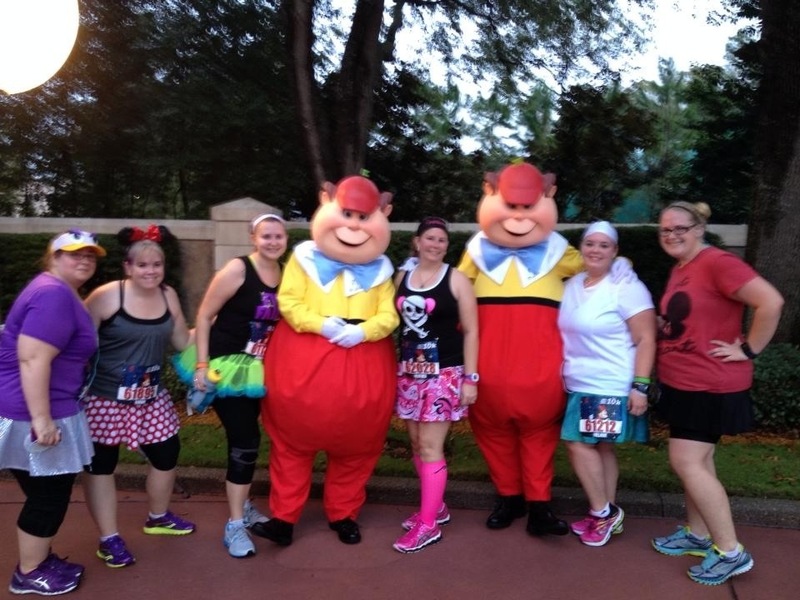 Have you ever done a runDisney meet-up? I’m a charity athlete raising funds for St. Jude. To donate, visit my personal fund-raising page here. 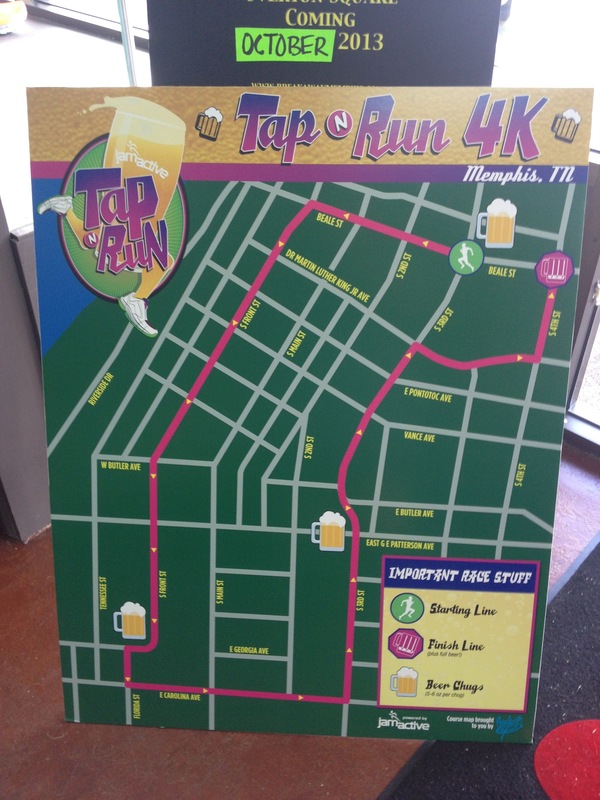 Yesterday I did the Tap N Run 4k Memphis, which was a beer run. It sounded like a good idea at first. Beer before noon can’t be all that bad, right? Except for the event wasn’t in the morning. It was at 2 pm in the afternoon. It still didn’t sound too bad. After all, October afternoons are pretty nice. Yeah! Turns out it was almost 90 degrees with 80-something percent humidity, and what appeared to be an overcast day turned into full sun by 2 pm. It was HOT! It was still fun, though. Basically, you drink your way through the race. You get a small beer to toast the start, about 6 ounces. 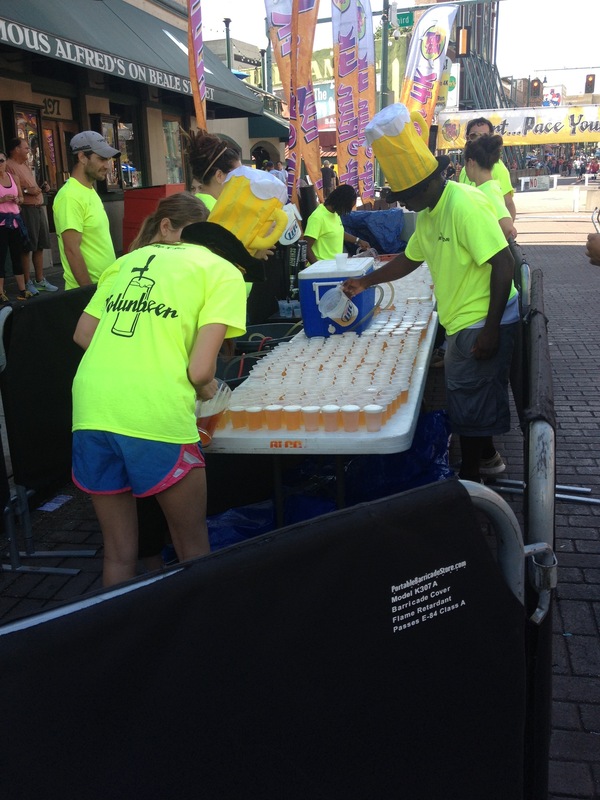 The Volunbeers are getting the cups of beer ready for the start. Then, you get another small beer at each of 2 water, uh, beer stops, called Beer Chugs. 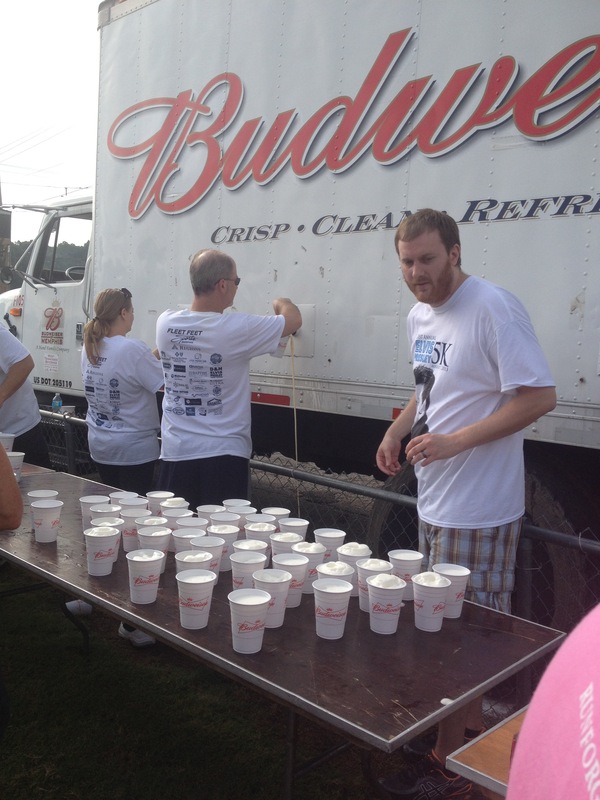 Beer Chugs were in place of water stops. Water was available, too, though. Then, after the finish, you get a full-sized can of beer. The beer was surprisingly refreshing on the hot day. 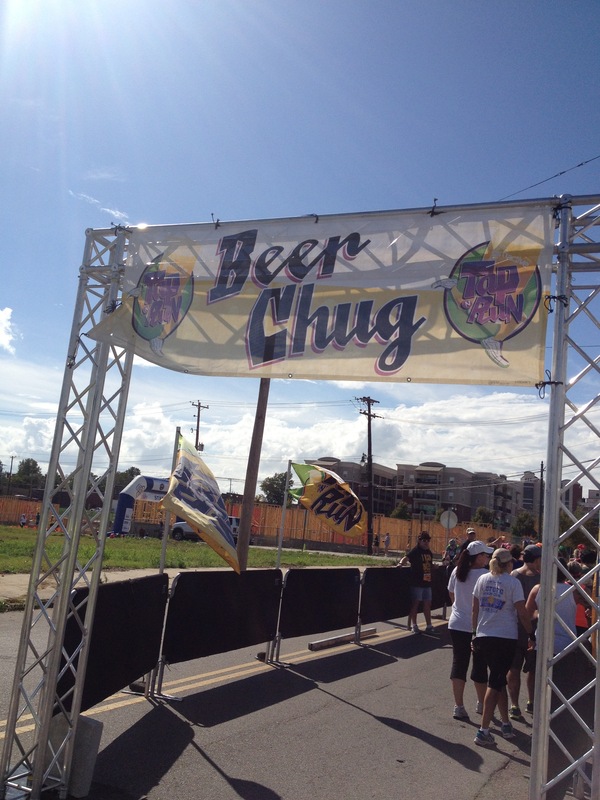 The first beer at the start was Schlafly Ale. The first Beer Chug had an orange beer, which was delicious! It was so refreshing! I wish I knew what it was so I can buy it. I asked but the volunteers (called Volunbeers) didn’t know. The second Beer Chug had Pabst Blue Ribbon, and at the end, you got your choice of Miller Light or Coors Light. So many fun costumes in the crowd! 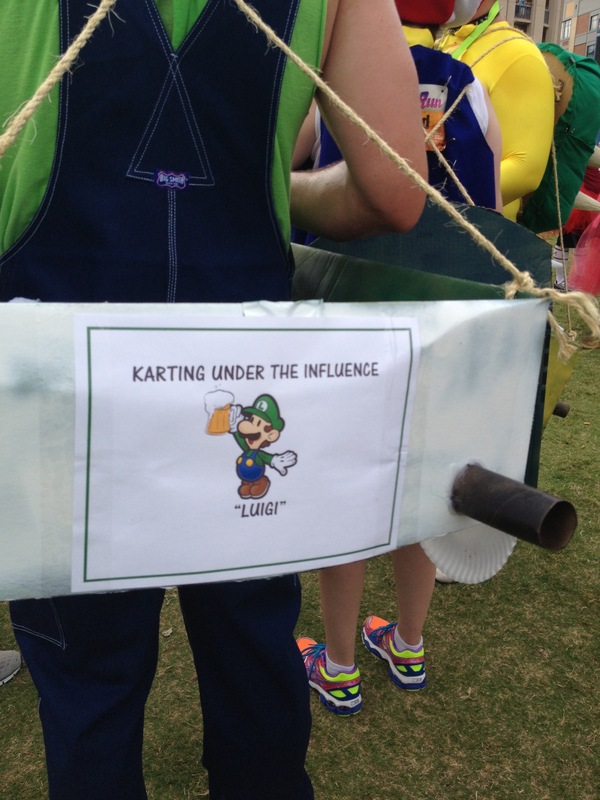 I saw many groups dressed in all the Mario characters. Monsters U was well represented, and I saw Thing One and Thing Two. 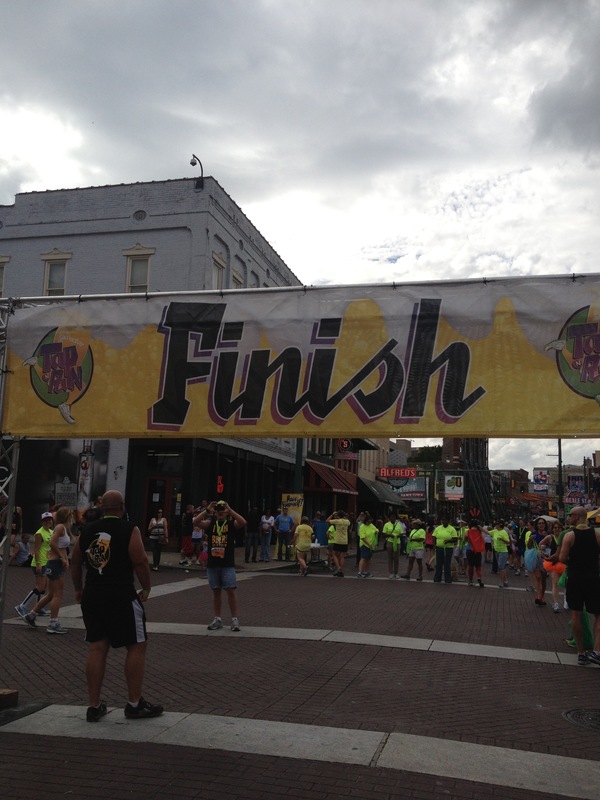 Because it started and ended on Beale Street downtown, there were many tourists spectating. 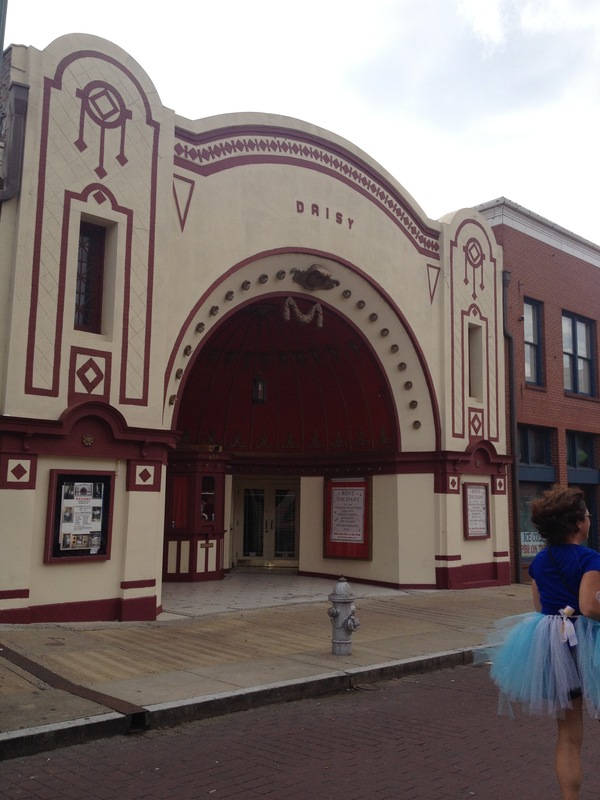 One tourist asked what was going on, and someone responded that it was just a typical afternoon in downtown Memphis. It was funny! Everyone got a finisher’s medal, too, which doubles as a bottle opener. Always useful! The medal doubles as a bottle opener! One of my favorite things about this run is that since it wasn’t timed, I took some pics that I wouldn’t normally take time to snap, like the finish line! Have you ever done a beer run? I’m a charity athlete raising money for St. Jude. To make a donation, click here. 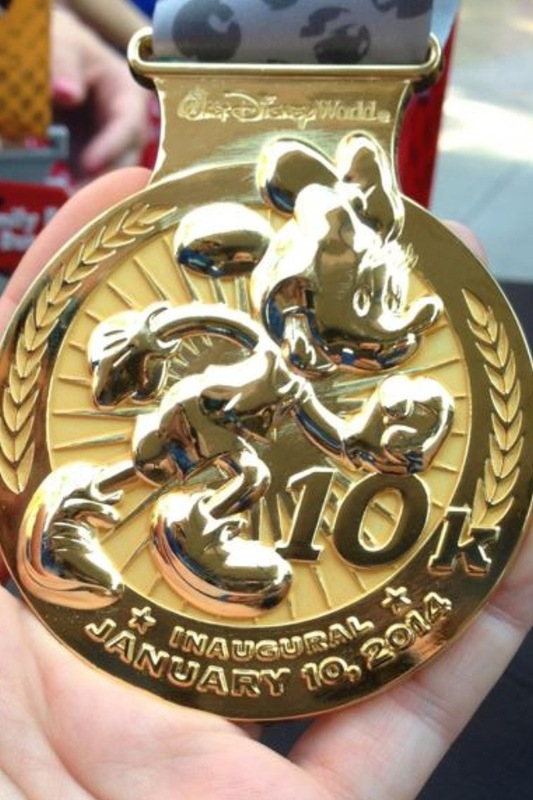 runDisney races have become so popular that they often sell out the first day registration opens. Since registration can open up to 8 months before the event, you have to be an uber planner to get in lately. I love to plan, just not always that far in advance. With the exception of the Inaugural Tower of Terror 10 Miler, all 4 of the other runDisney races I’ve registered for have been more of an afterthought, months after registration opened. Lucky for me at the time, the races weren’t selling out in a day and I was able to get into the ones I wanted. 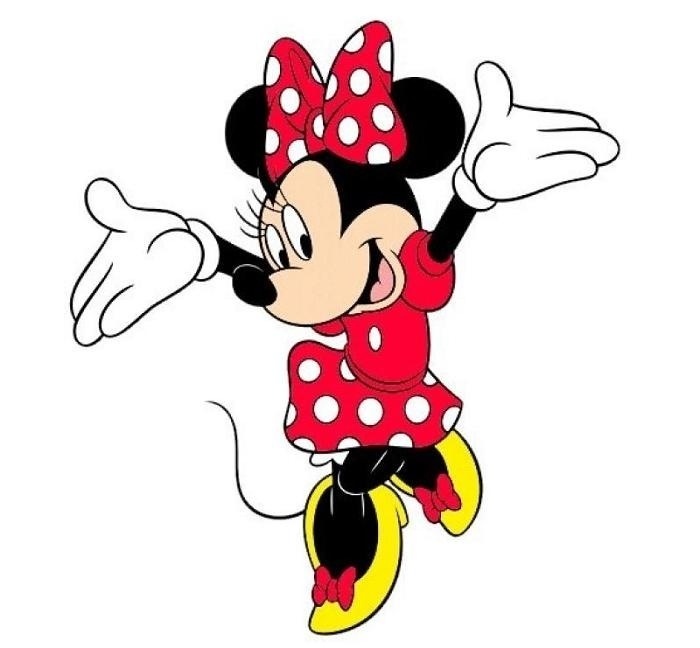 My luck ran out when I decided I wanted to run in the Inaugural Minnie 10k being held during Marathon Weekend next year. I had not initially intended to participate in Marathon Weekend at all. With a half marathon planned in October, November, and December, my mind and body could not handle January, too. That all changed when some of my runner friends suggested volunteering. We could split the room 4 ways and I could fly virtually free on miles, making it a fairly inexpensive trip. I have to admit, the thought of enjoying a runDisney weekend without any pressure was appealing, as was the different perspective. I was in! Of course it wasn’t long until my thoughts turned to running again. I still was not willing to take on another half, but the Minnie 10k started looking better and better. Even though it was already sold out, I knew that closer to the event, people would back out, and I’d likely be able to buy a spot from someone else. The thought totally crossed my mind to do this, but it’s not ideal for several reasons. It’s against the rules! 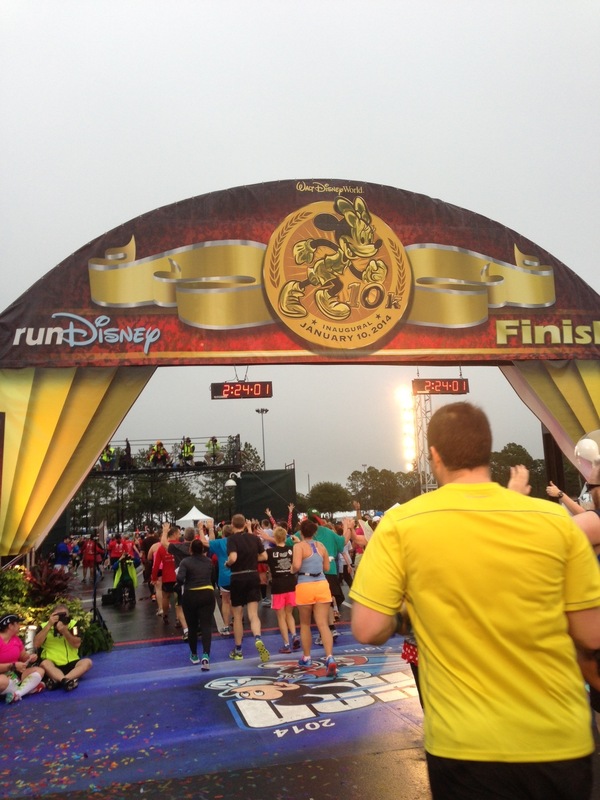 runDisney has a policy against bib transfers from one runner to another. 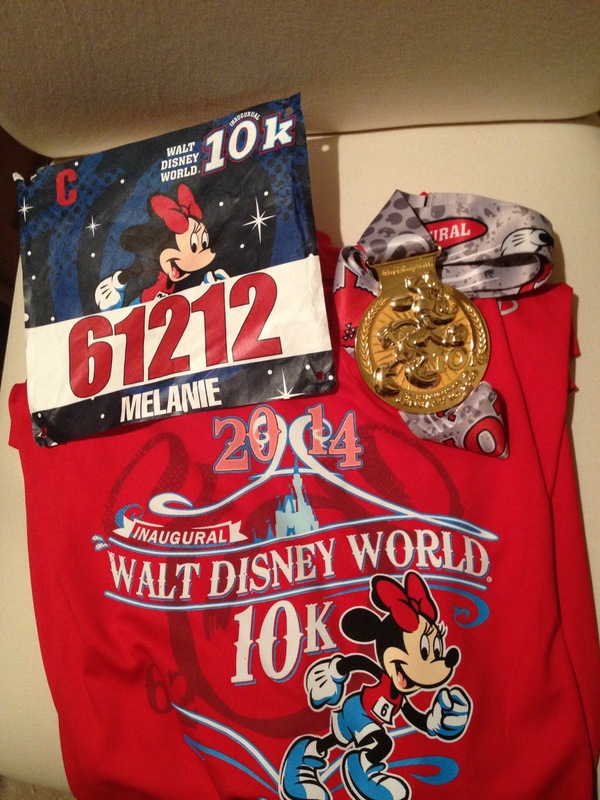 Rumor has it that anyone caught buying or selling a bib in this manner can be banned from runDisney events for life. I don’t believe I’ve ever actually read this in black and white, and I know I’ve never heard of anyone who actually got banned for this reason. However, rules are rules, and that’s the rule. No bib transfers! Lack of recourse. These “illegal” bib sales can happen months before the event. Even if you use PayPal, often the time to file a claim has expired before you would ever know there was a problem. Unless you happen to be lucky enough to know the person you are buying from, you are trusting a complete stranger to be honest and deliver on their part when it’s time for the expo and bib pick-up. Wrong name on your bib. Ok, this may not be a big deal to some, but I bet if you are a guy named John, you don’t want to run wearing a bib with the name Heather on it. 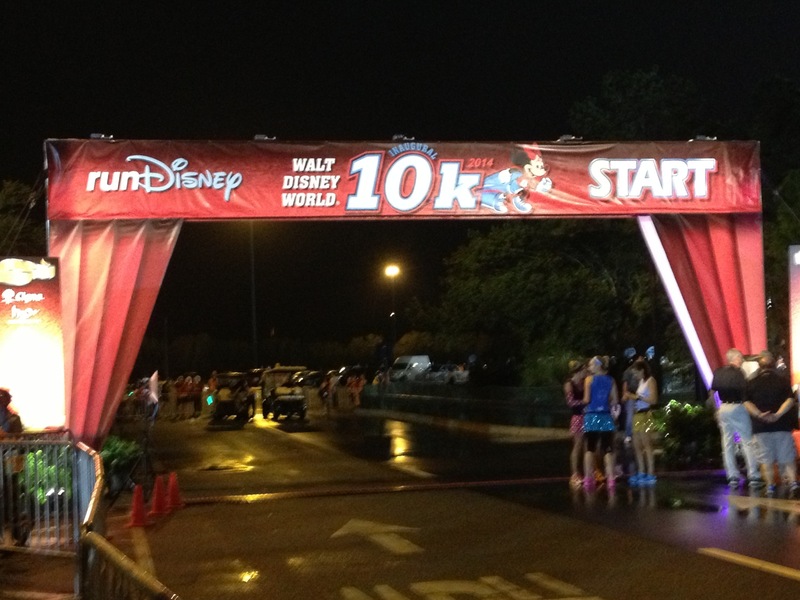 runDisney can choose to crack down on the rules at any time. They could easily say only the registrant picks up the packet, meaning you could have paid someone for a bib you can’t even pick up. Do I think they will do this without warning? No. With Disney’s track record for changing things with little or no notice, I don’t think I’d want to chance it, though. 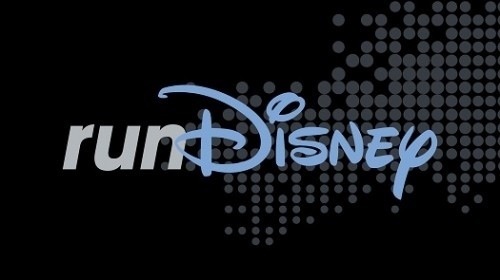 Edit: runDisney has, in fact, changed the rules, and starting with Avengers weekend at Disneyland in November 2014, they no longer allow packets to be picked up by anyone other than the person registered. So, what to do? The answer is right on the runDisney website. You can register through various charities and/or travel groups. Yes, a lot of the charities ask you to raise thousands of dollars, often in exchange for race entry fees, accommodations, even air fare and other amenities. There are some, though, that just ask you to raise a few hundred dollars in exchange for race fees only. Then there are the travel groups. Many require you to book your entire trip with them in order to buy the race entry. However, there are some that will just let you register for the race, hoping you will book something with them at some point. At any rate, you do have to dig through the lists to figure out what the requirements are for each one. I found one travel group that didn’t list what they had available or what the requirements were. I just had to fill out an interest form online telling them what I wanted. Within a couple of hours, I got an email back saying they had a Minnie 10k registration available, and for me to call them to get it set up. I called, still thinking they might at least want me to buy park tickets from them in order to get the registration. Nope! I gave them my information, paid only the race entry fee, and got my Active confirmation the next day. I could hardly believe that I had just successfully, legally, and in my name, obtained an entry for a race that had been sold out for months. Two of my other friends also registered for other sold out runDisney races using these methods. The moral of the story is that you do not have to buy a bib under the table and run in someone else’s name. Just do a little digging and research and you can either book through a travel group or find a great charity to help support. I am a charity athlete for St. Jude. To donate, click here. 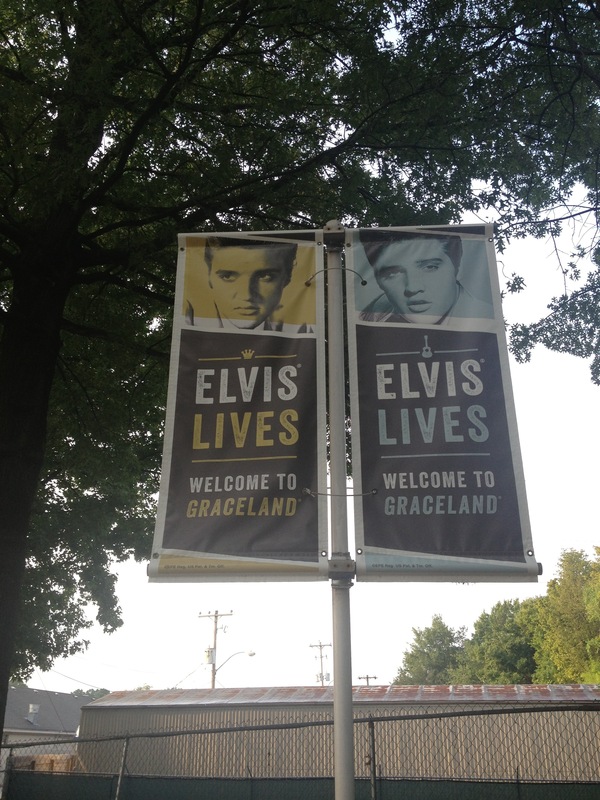 Graceland, here in Memphis, is like Mecca for Elvis fans. 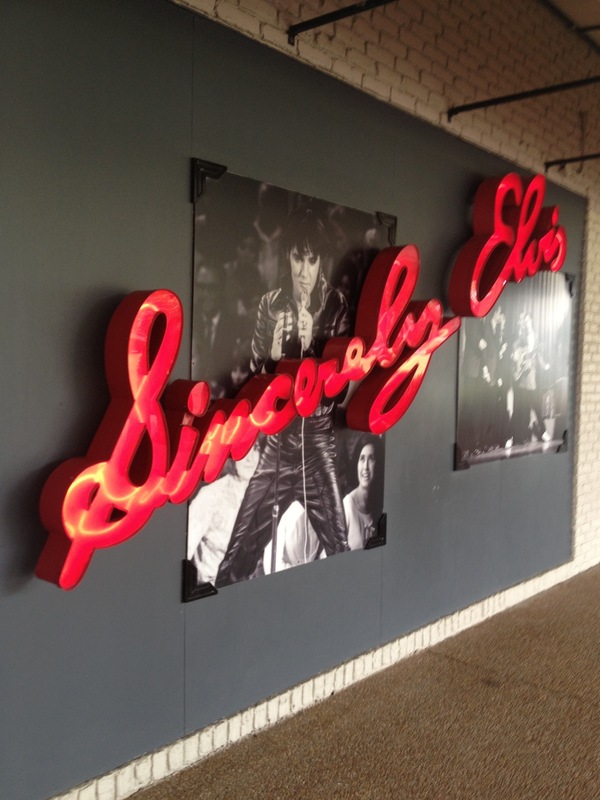 Every August, thousands upon thousands of Elvis fanatics from all over the world converge upon Memphis to pay homage to the King of Rock and Roll. 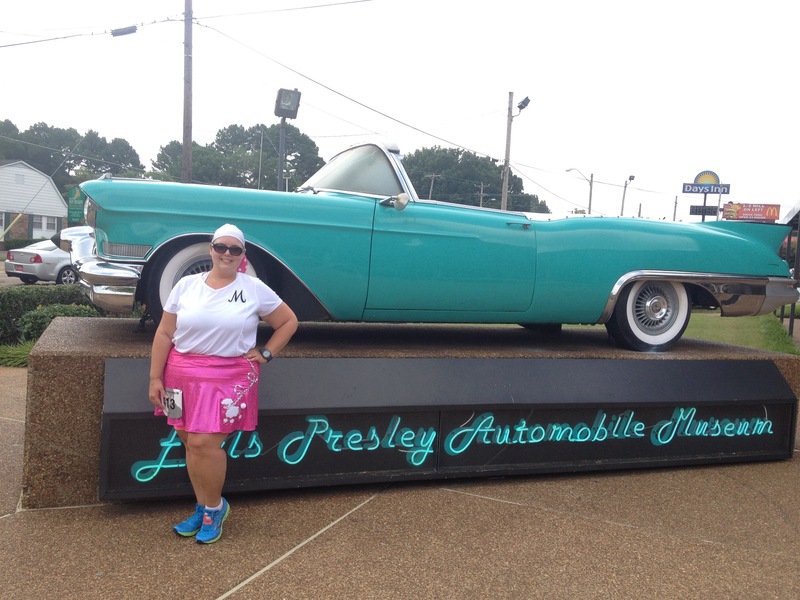 The week-long celebration culminates with a 5k that starts and finishes at the Graceland entrance. 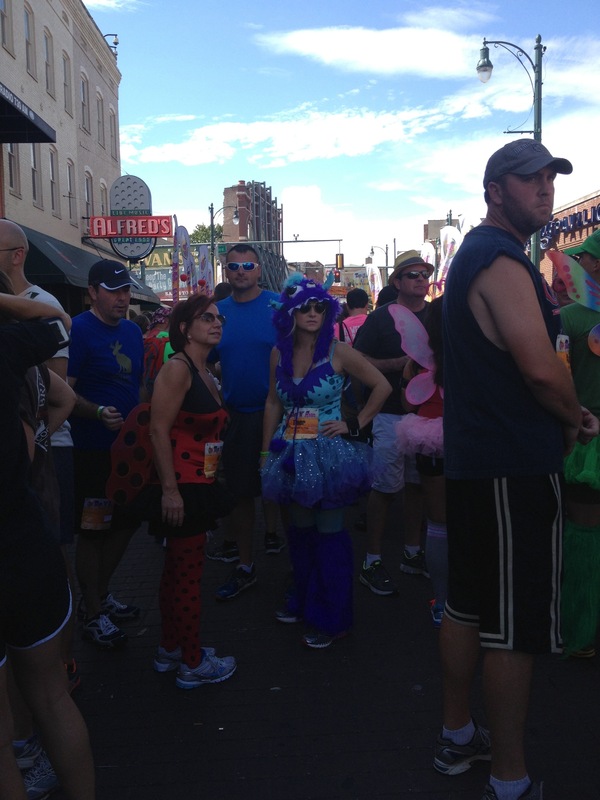 This is one of Memphis’s biggest 5ks and is one of the few, if not the only 5k where dressing in costume is acceptable. There is even a contest for the best Elvis male and female. It’s great for people-watching. 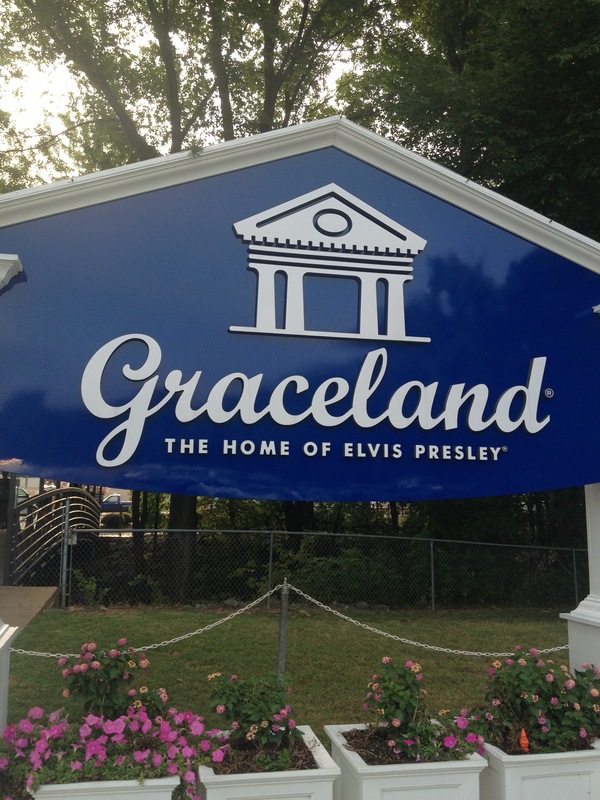 Interestingly, if you ask Memphis locals, most of us have never been to Graceland. Those that I know who have been, went with out-of-town guests they were entertaining. So, this area of town is very touristy and going there almost felt like I was on a vacation, with all the kitschy souvenir shops and Elvis-themed hotels and restaurants. Elvis shops line the street in front of Graceland. 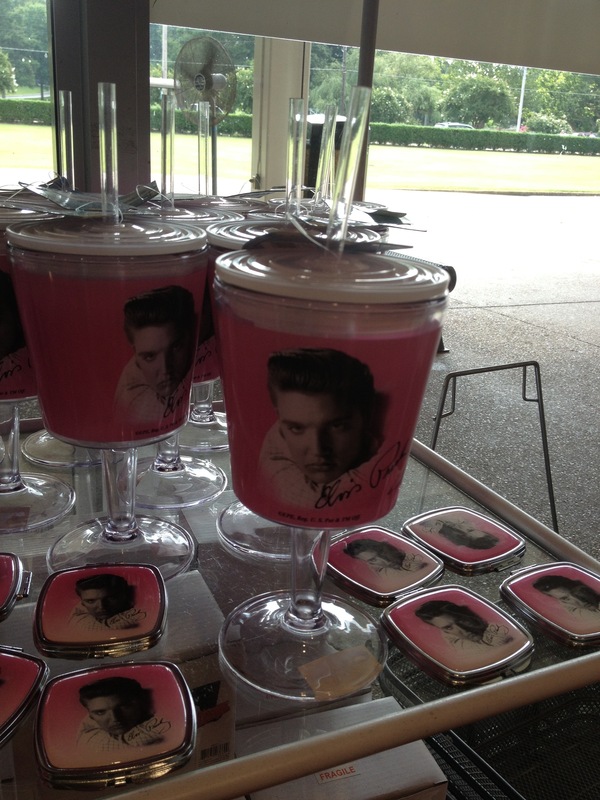 Souvenir shops are filled with everything Elvis. 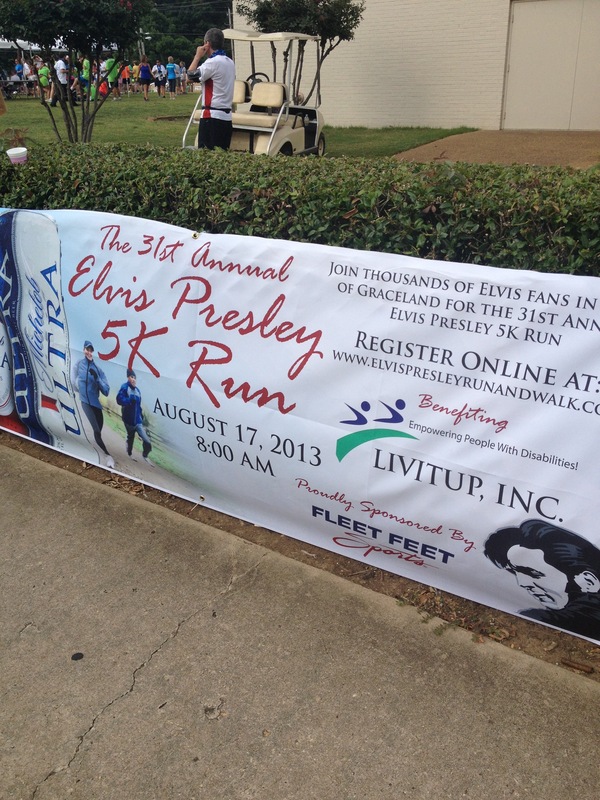 Something else funny is that I ran this race last year and didn’t even notice I was in front of Graceland. Talk about tunnel vision! Last year I loved seeing all the Elvis costumes and sunglasses so much that I decided to join in the fun this year. 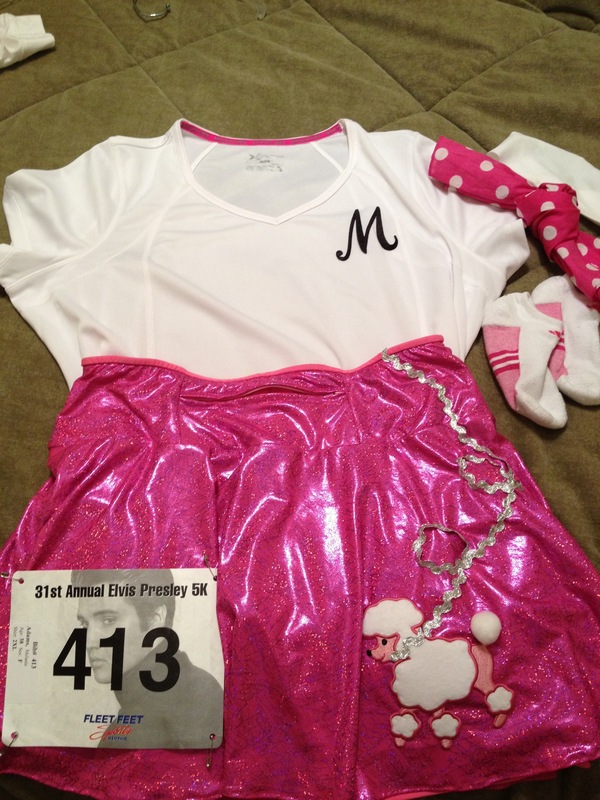 I had a pink Sparkle Skirt that I sewed a poodle onto to make a poodle skirt. I added a black initial to a white tech top, tied a pink-with-white-polka-dots bandana in my hair, and I was all set. I got lots of compliments on my outfit, even though it was more 50s inspired than Elvis inspired. The course itself is a really great course. It’s mostly flat with a few hills scattered in. Most of the course is actually through the residential areas around Graceland so it’s fairly well shaded. Several of the home owners had their water hoses out to spray down the runners, keeping us cool. Even though it was a nice day this year with temps in the low 70s and overcast, it still felt great to get sprayed down every now and then. One highlight was seeing the Navy captains run in formation for the entire race. Navy Captains lining up for the start. They did this last year, too, and it’s so fun to watch. 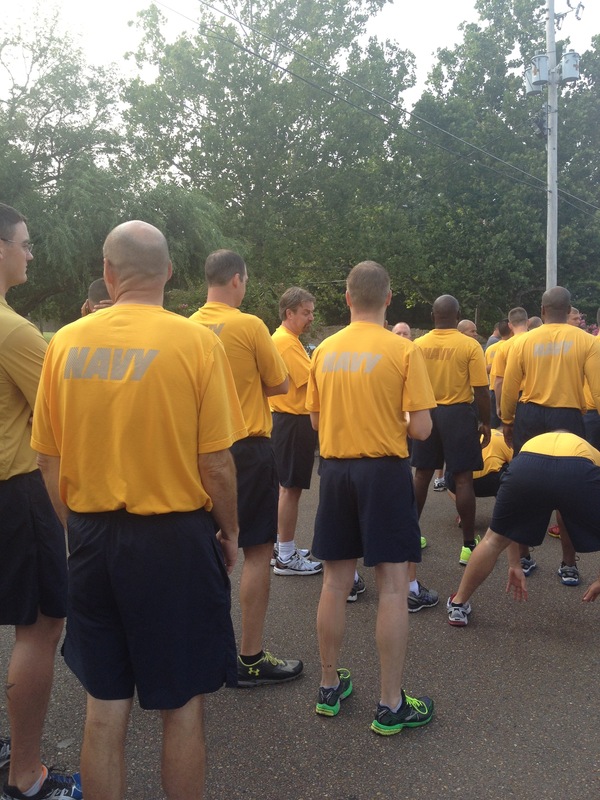 Of course, running next to Navy men is never a bad thing! The after party was so much fun, too. Post-race food was Krispy Kreme donuts, bananas, bags of white cheddar pop corn, pasta with meat sauce and alfredo sauce, smoothies, bagels, water, and freely flowing beer. Gotta love a truck with a tap right on the side! 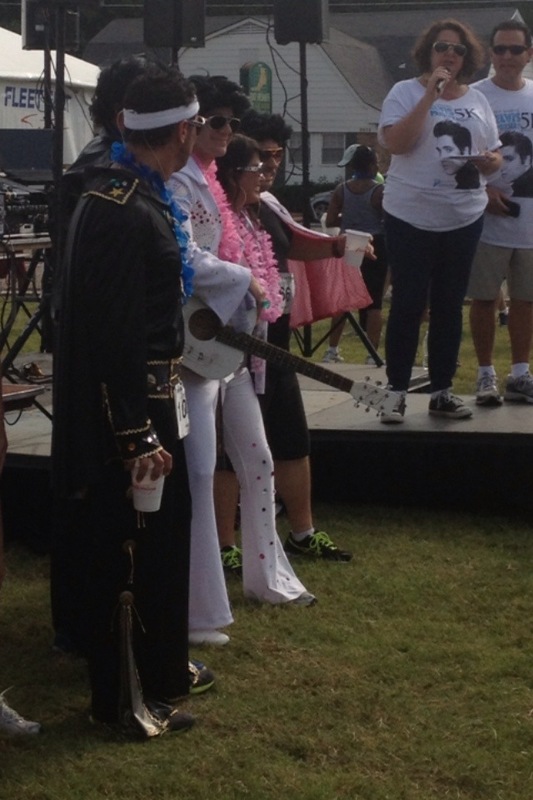 At the awards ceremony, they gave $100 each to the best male and female Elvis tribute runner. The female winner ran the entire race in gold leggings. I can’t imagine how hot and sticky that was! The male winner ran in white patent leather shoes. Talk about blisters and sore feet! He didn’t seem to mind, though. 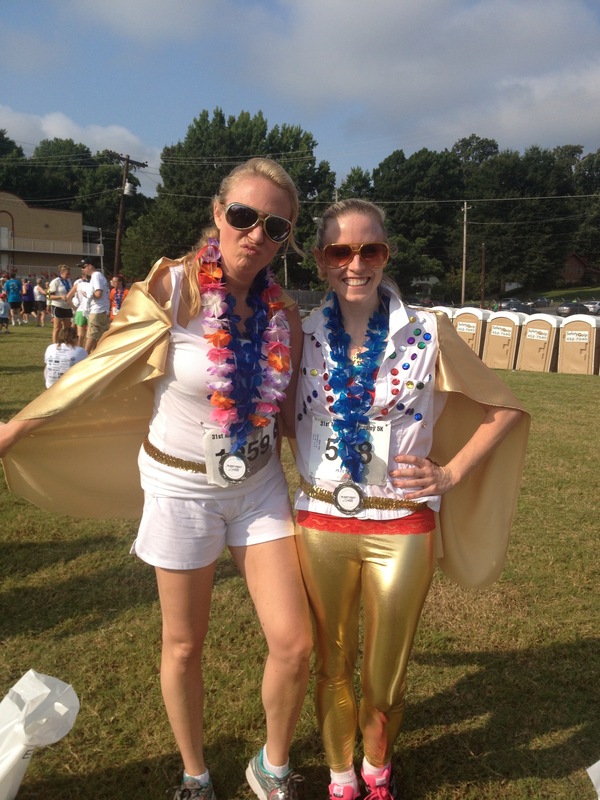 The Female Elvis Costume winner went to the one of the right in the gold leggings. Those are white patent leather shoes the Male Elvis Costume winner wore. The only negative was that a few days before the race, they sent an email saying the first 800 finishers would receive a medal. I think if any race gives out finishers medals, they should be for all finishers, not just the top 800. With over 1100 finishers, that leaves a lot of people out. The race director put on Facebook that the reason was due to expenses and they wanted as much money as possible to go to the charity, Livitup. I can appreciate wanting to maximize the charitable donation. At the same time, if you can’t afford medals for all, don’t offer them period. Medals were not mentioned on the event website and were not advertised at all so they would not have been expected had that email not been sent. It’s really not that big of a deal, but it did put a damper on a really fun event. I was really happy with my race performance. Post-Race Pic–all I need is a milkshake with a cherry on top. I got a PR, which I’ve managed to do at every 5k I’ve run this year except for one. I really hope this trend continues for my half marathons this fall. I’m a charity athlete raising money for St. Jude. To make a donation, visit my personal fund-raising page here. 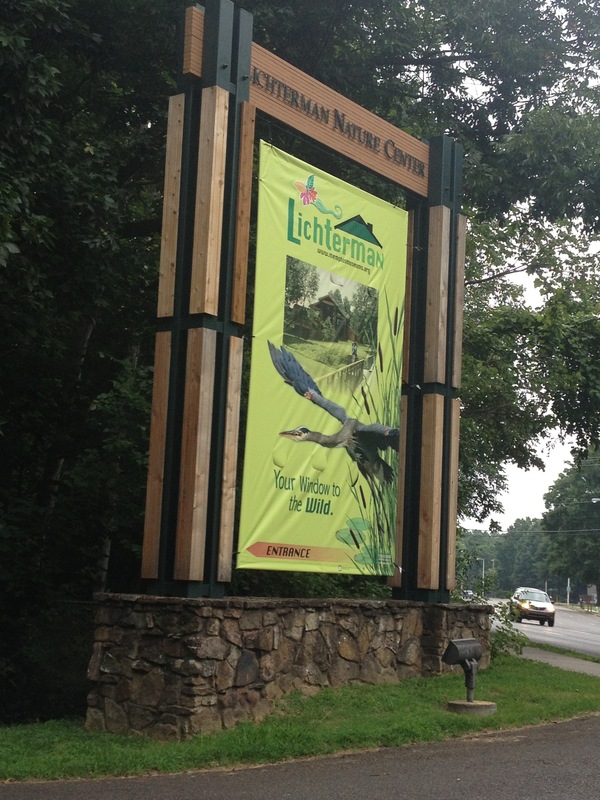 This past Saturday I had the privilege of attending the St. Jude Heroes Kickoff Breakfast at Lichterman Nature Center in Memphis.I attended last year’s breakfast as well, and I must say they kicked it up a notch this year. I’m so excited about all the things they have planned to support us through this fund-raising and training season. 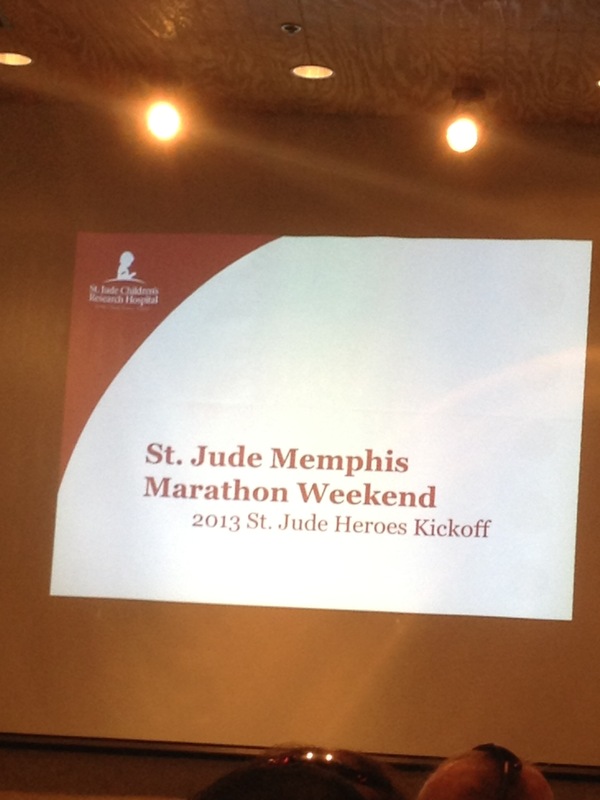 The only money St. Jude receives from the St. Jude Memphis Marathon Weekend is the money raised by Heroes. All of the registration money goes to pay for the event itself. I didn’t know this until last year. All someone has to do to become a Hero for St. Jude is commit to raising funds. 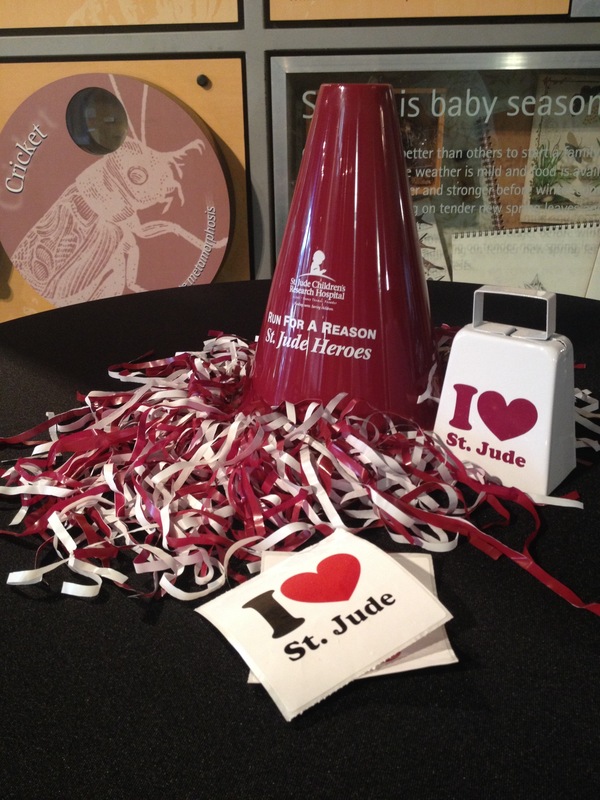 The success of the Heroes program has made the St. Jude Memphis Marathon Weekend the biggest single fund-raising event of the organization, even bigger than their Dream Home campaign. Because of the success of the Heroes program around this event, St. Jude has expanded its Heroes program to include other athletic events around the country, including the Chicago Marathon, NYC Marathon, and even the Boston Marathon. That’s right! Can’t qualify by time? You can fund-raise your way into Boston with St. Jude. 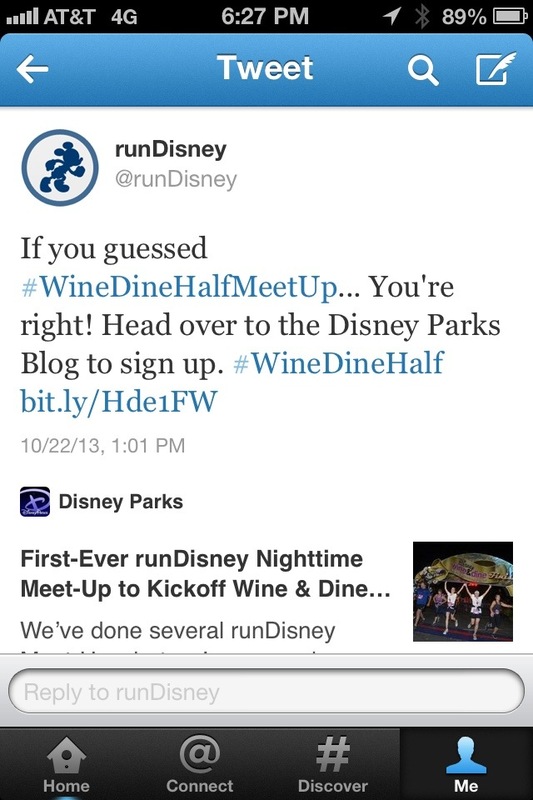 They’ve even partnered with runDisney to offer race entries for Wine and Dine Half and Princess Half for fund-raising. This particular breakfast was specifically for Heroes raising funds for the Memphis event in December. I’m always impressed by any event this organization puts on, and this breakfast was no different. Everyone was so friendly and welcoming, making sure we all had what we needed. 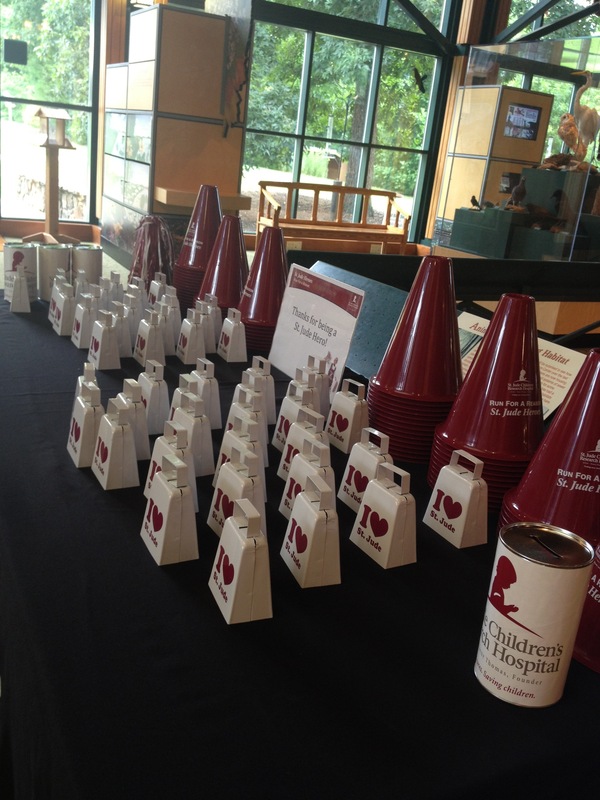 There were table decorations to set the stage, and even a swag table that we were invited to help ourselves to. 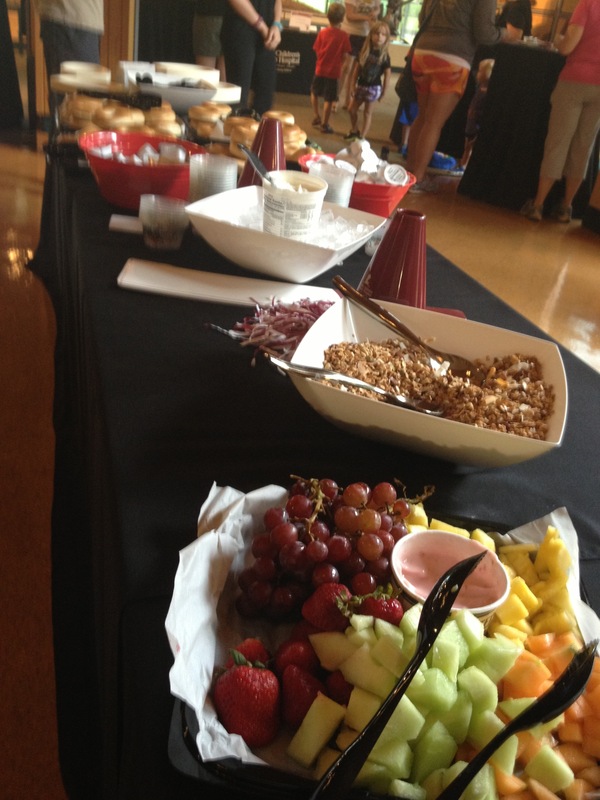 Breakfast was provided by McAlister’s Deli, and coffee was provided by Community Coffee. They even gave each of us a training journal, a magnet with the entire calendar of events throughout our training season, a note pad, and pen. Once the program started, we found out they have some surprises in store for us in the coming months. I cannot wait to find out what that’s all about! We heard from Kevin Leathers, the national St. Jude Running Coach and owner of Can’t Stop Endurance coaching and consulting. I loved working with him last year, and I am excited for even more opportunities to work with him this year. Last year, he hosted monthly group runs with us and I attended every one of them. This year, I was excited to find out he is hosting WEEKLY group runs starting this Saturday. That means I get to work with him every week from now until the race if I want to. He will also be repeating the monthly training clinics he held last year as well. I will for sure be attending as many of those as I can. Additionally, they will be supporting us through training and fund-raising Facebook chat events. These are great since not all Heroes are from Memphis. Participants from all over the world can take advantage of these Facebook events. We then met a young man named Ramon and his mother. Ramon was treated at St. Jude for Hodgkin’s Lymphoma when he was 6. His mother told the emotional story of his diagnosis and their fear of not only the dreadful disease but also of how they were going to financially afford his treatment. They were shocked and ecstatic to learn that no patient is ever billed for anything. They were also thrilled that St. Jude didn’t look or feel like a hospital. Kids were laughing and having fun despite their diseases. They put Ramon and his needs first and took care of everyone’s emotional needs as well as Ramon’s physical needs. Ramon is 13 now and cancer-free! She truly feels that if it were not for the work of fund-raisers like the Heroes program, her son would not be alive and countless more kids would die of cancer than do. Her gratitude was genuine and hearing stories like theirs is always emotional. The entire event reinforced for me why I am a St. Jude Hero. We truly are running for a purpose. We are making a difference in the lives of these kids and countless more to come. Ramon’s mother mentioned that she often wonders if Danny Thomas knew what he was creating 51 years ago. I’m not sure if anyone will ever know that answer to that, but we know now what he did create. He created what would become the world’s leading children’s research hospital, a place where kids and their families can come, financially worry-free, to be treated for cancer and other life-threatening illnesses, where their child comes first, where there’s hope. Like my Facebook page at www.facebook.com/MyGlassSneaker. 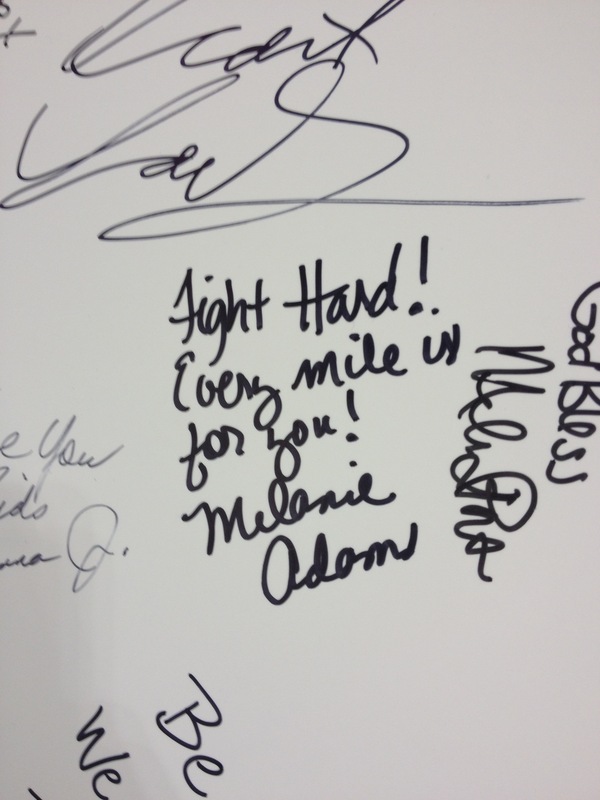 To donate to my personal fund-raising page or make a donation, visit www.heroes.stjude.org/Melanie_Adams. There is a little time left to register for my virtual run to benefit St. Jude. To register or for details, click here. 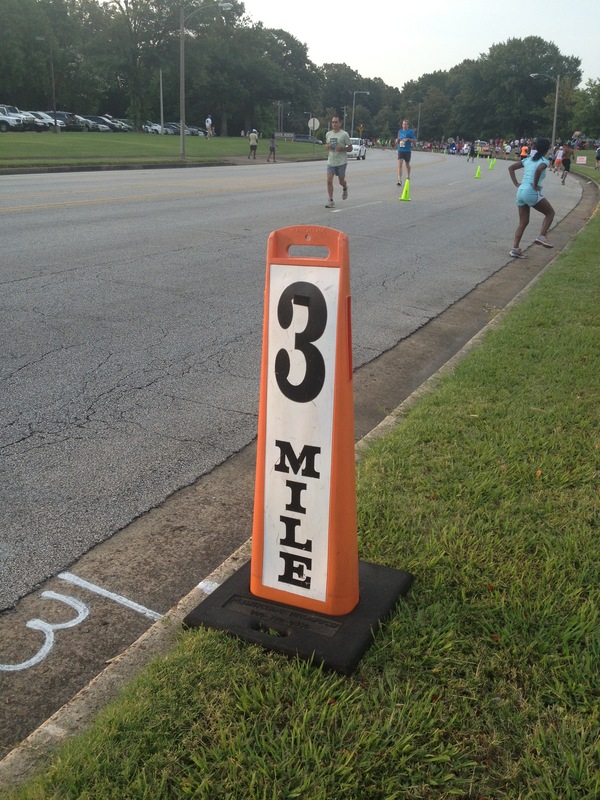 As you may know by now the Memphis Runners Track Club Road Race Series is a 10 race series of various distances from 5k to half marathon. There are 2 races of each distance, and if you do both of them, they only count your fastest time. This worked out well for me at the second 5k, which was on Sunday, because I had the worst 5k I’ve had all year. The first 5k of the series was the best 5k I’ve had all year. I attribute my poor performance to lack of sleep, poor eating from work travel, and decreased workouts last week also from work travel. I really shouldn’t be making excuses. The weather was absolutely perfect, and it really was a great race. Both of them were. I really enjoy the Road Race Series. It’s low-key, and since I suffer a bit from race anxiety, I appreciate low-key. 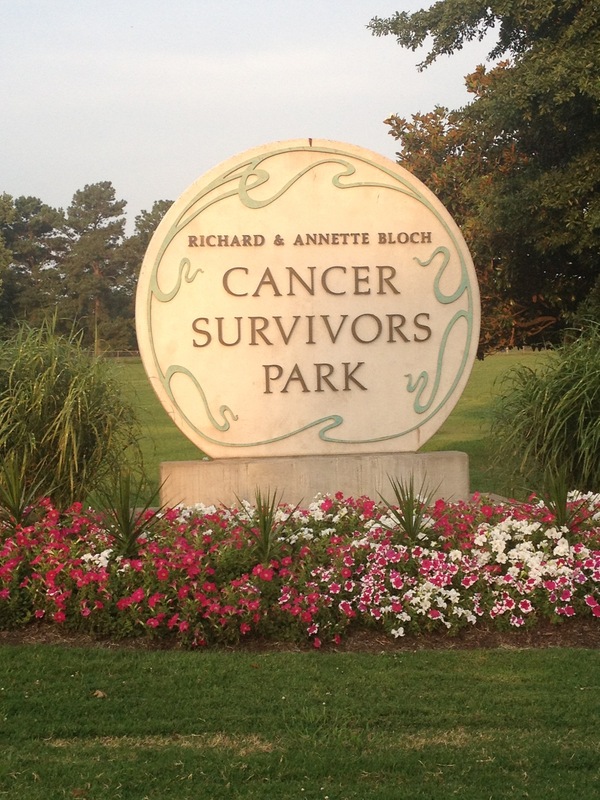 The 5ks were held at the Cancer Survivors Park. 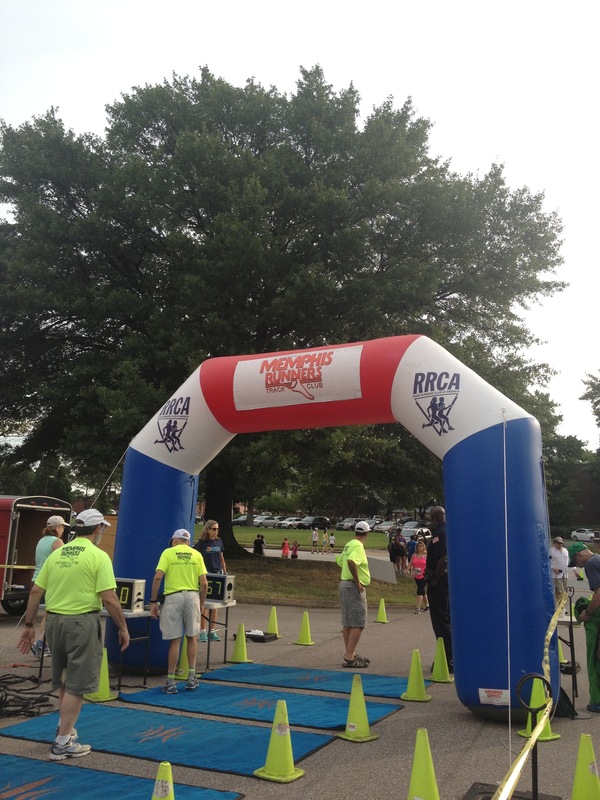 Both 5ks of the Road Runners Series were held at the Cancer Survivors Park. I enjoy this course because it’s fairly flat with just enough hills to keep it interesting. It’s also a pretty quiet, mostly residential neighborhood, which helps to make it a relaxing run. I actually took this as I was walking to the start line. I wish I was fast enough to be able to sacrifice time to take more pictures on course. There is not much traffic in the area that time of day so they are able to close off 2 lanes of traffic for much of the course, so the course isn’t very crowded. So a lovely course, fabulous weather, and the always wonderful support made for a fun race, even if it didn’t make for a fast time. 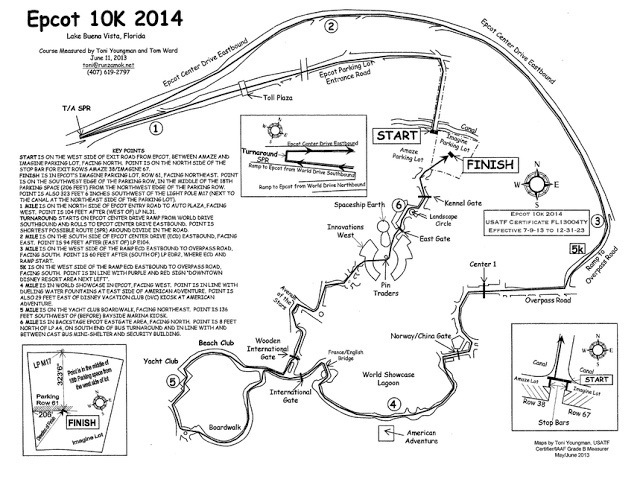 In less than 2 weeks, the first 5 miler is coming up. Since I’ve never had an “official” time at that distance, I’m guaranteed a PR, as long as I finish. I have this to say about that: Go Me! 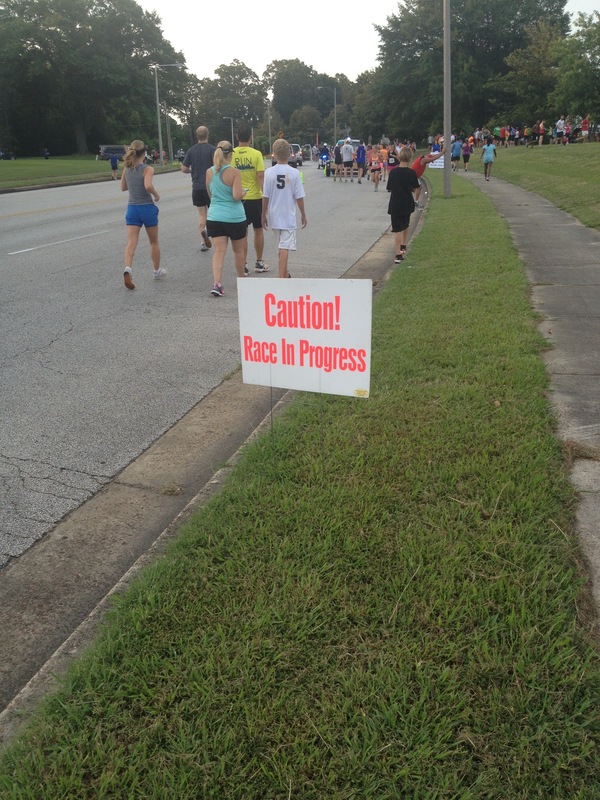 Have you ever participated in a race series? There is still time to register for my virtual run, Magic Carpet Run 2013, to benefit St. Jude. For details or to register, click here. I’m a charity athlete for St. Jude. To make a donation, visit my fund-raising page here.